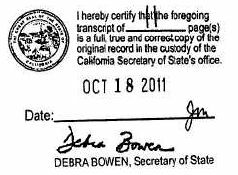 TWO: The purpose of the corporation is to engage in any lawful act or activity for which a corporation may be organized under the General Corporation Law of California other than the banking business, the trust company business or the practice of a profession permitted to be incorporated by the California Corporations Code. THREE: The name and address in the State of California of this corporation’s initial agent for service of process is George L. de la Flor, APC, 8355 La Mesa Blvd., La Mesa, CA 91941. FOUR: This corporation is authorized to issue only one class of shares of stock, which shall be designated common stock. The total number of shares which this corporation is authorized to issue is ONE HUNDRED MILLION (100,000,000) shares. FIVE: The liability of the directors of the corporation for monetary damages shall be eliminated to the fullest extent permissible under California law. SIX: The corporation is authorized to indemnify the directors and officers of the corporation to the fullest extent permissible under California law. IN WITNESS WHEREOF, the undersigned, being all the persons named above as the initial directors, have executed these Articles of Incorporation. The name of the corporation is Genius Brands International, Inc. (the "Corporation"). 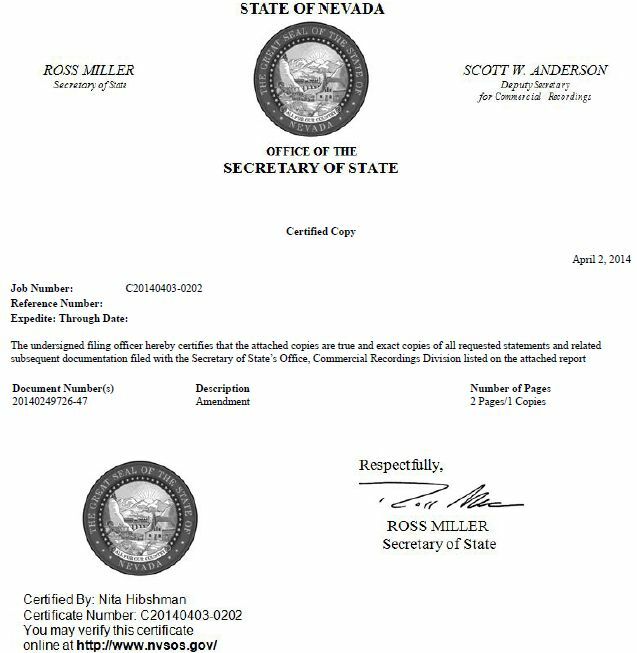 The name and address of the Corporation's resident agent for service of process is The Corporation Trust Company of Nevada, 311 South Division Street, Carson City, Nevada 89703 (County of Carson City). The purpose of the Corporation is to engage in any lawful act or activity for which corporations may be organized under the Nevada Revised Statutes (“NRS”). 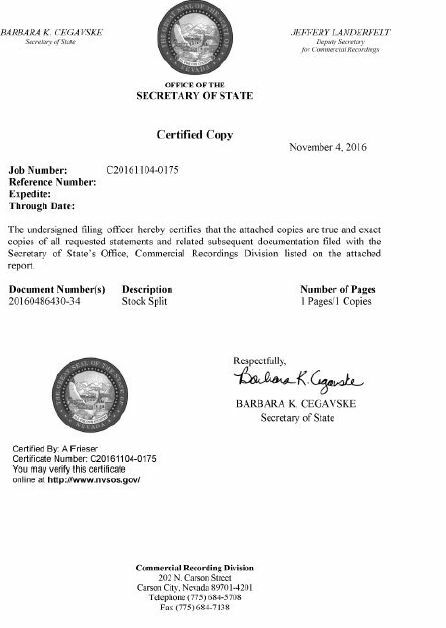 4.01 Authorized Capital Stock. The total number of shares of stock this Corporation is authorized to issue shall be two hundred sixty million (260,000,000) shares. This stock shall be divided into two classes to be designated as "Common Stock" and "Preferred Stock." 4.02 Common Stock. The total number of authorized shares of Common Stock shall be two hundred fifty million (250,000,000) shares with par value of $0.001 per share. Each share of Common Stock when issued, shall have one (1) vote on all matters presented to the stockholders. (i) Such other rights and provisions with respect to any class or series as may to the board of directors seem advisable. The shares of each class or series of the Preferred Stock may vary from the shares of any other class or series thereof in any respect. The Board of Directors may increase the number of shares of the Preferred Stock designated for any existing class or series by a resolution adding to such class or series authorized and unissued shares of the Preferred Stock not designated for any existing class or series of the Preferred Stock and the shares so subtracted shall become authorized, unissued and undesignated shares of the Preferred Stock. The Board of Directors shall be divided into two classes, each such class as nearly equal in number as the then-authorized number of Directors constituting the Board of Directors permits, with the term of office of one class expiring each year. 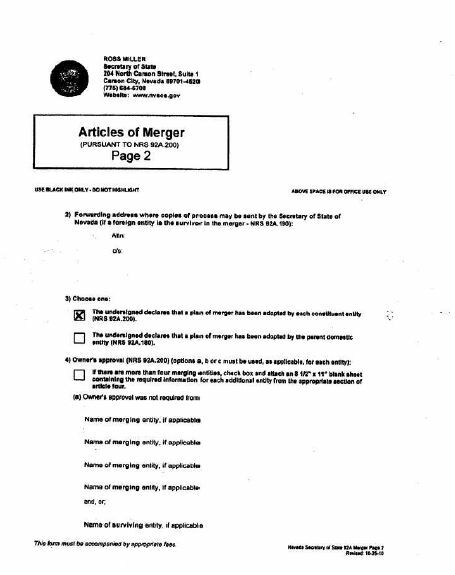 Following approval of this Articles of Incorporation, the stockholders shall elect one class of Directors until the first annual meeting of stockholders (the “Class B Directors”) and another class of Directors for a term expiring at the following annual meeting of stockholders (the “Class A Directors”). Thereafter, each Director shall serve for a term ending at the second annual meeting of stockholders of the Corporation following the annual meeting at which such Director was elected. Members of each class shall hold office until their successors are elected and qualified. At each succeeding annual meeting of the stockholders of the Corporation, the successors of the class of Directors whose term expires at that meeting shall be elected by a plurality vote of all votes cast at such meeting to hold office for a term expiring at the annual meeting of stockholders held in the second year following the year of their election. Subject to the foregoing, the number of directors comprising the board of directors shall be fixed and may be increased or decreased from time to time in the manner provided in the bylaws of the Corporation, except that at no time shall there be less than one director. The individual liability of the directors and officers of the Corporation is hereby eliminated to the fullest extent permitted by the NRS, as the same may be amended and supplemented. Any repeal or modification of this Article by the stockholders of the Corporation shall be prospective only, and shall not adversely affect any limitation on the personal liability of a director or officer of the Corporation for acts or omissions prior to such repeal or modification. Every person who was or is a party to, or is threatened to be made a party to, or is involved in any action, suit or proceeding, whether civil, criminal, administrative or investigative, by reason of the fact that he, or a person of whom he is the legal representative, is or was a director or officer of the Corporation, or is or was serving at the request of the Corporation as a director or officer of another corporation, or as its representative in a partnership, joint venture, trust or other enterprise, shall be indemnified and held harmless to the fullest extent legally permissible under the laws of the State of Nevada from time to time against all expenses, liability and loss (including attorneys' fees, judgments, fines and amounts paid or to be paid in settlement) reasonably incurred or suffered by him in connection therewith. Such right of indemnification shall be a contract right which may be enforced in any manner desired by such person. The expenses of officers and directors incurred in defending a civil or criminal action, suit or proceeding must be paid by the Corporation as they are incurred and in advance of the final disposition of the action, suit or proceeding, upon receipt of an undertaking by or on behalf of the director or officer to repay the amount if it is ultimately determined by a court of competent jurisdiction that he is not entitled to be indemnified by the Corporation. Such right of indemnification shall not be exclusive of any other right which such directors, officers or representatives may have or hereafter acquire, and, without limiting the generality of such statement, they shall be entitled to their respective rights of indemnification under any bylaw, agreement, vote of stockholders, provision of law, or otherwise, as well as their rights under this Article. Without limiting the application of the foregoing, the board of directors may adopt bylaws from time to time with respect to indemnification, to provide at all times the fullest indemnification permitted by the laws of the State of Nevada, and may cause the Corporation to purchase and maintain insurance on behalf of any person who is or was a director or officer of the Corporation, or is or was serving at the request of the Corporation as director or officer of another corporation, or as its representative in a partnership, joint venture, trust or other enterprises against any liability asserted against such person and incurred in any such capacity or arising out of such status, whether or not the Corporation would have the power to indemnify such person. The indemnification provided in this Article shall continue as to a person who has ceased to be a director, officer, employee or agent, and shall inure to the benefit of the heirs, executors and administrators of such person. The purpose of the Corporation is to engage in any lawful act or activity for which corporations may be organized under the Nevada Revised Statutes ("NRS"). 4.01 Authorized Capital Stock The total number of shares of stock this Corporation is authorized to issue shall be two hundred sixty million (260,000,000) shares. This stock shall be divided into two classes to be designated as "Common Stock" and "Preferred Stock." 4.02 Common Stock The total number of authorized shares of Common Stock shall be two hundred fifty million (250,000,000) shares with par value of $0.001 per share. Each share of Common Stock when issued, shall have one (1) vote on all matters presented to the stockholders. The Board of Directors shall be divided into two classes, each such class as nearly equal in number as the then-authorized number of Directors constituting the Board of Directors permits, with the term of office of one class expiring each year. Following approval of this Articles of Incorporation, the stockholders shall elect one class of Directors until the first annual meeting of stockholders (the "Class B Directors") and another class of Directors for a term expiring at the following annual meeting of stockholders (the "Class A Directors"). Thereafter, each Director shall serve for a term ending at the second annual meeting of stockholders of the Corporation following the annual meeting at which such Director was elected. Members of each class shall hold office until their successors are elected and qualified. At each succeeding annual meeting of the stockholders of the Corporation, the successors of the class of Directors whose term expires at that meeting shall be elected by a plurality vote of all votes cast at such meeting to hold office for a term expiring at the annual meeting of stockholders held in the second year following the year of their election. Every person who was or is a party to, or is threatened to be made a party to, or is involved in any action, suit or proceeding, whether civil, criminal, administrative or investigative, by reason of the fact that he, or a person of whom he is the legal representative, is or was a director or officer of the Corporation, or is or was serving at the request of the Corporation as a director or officer of another corporation, or as its representative in a partnership, joint venture, trust or other enterprise shall be indemnified and held harmless to the fullest extent legally permissible under the laws of the State of Nevada from time to time against all expenses, liability and loss (including attorneys' fees, judgments, fines and amounts paid or to be paid in settlement) reasonably incurred or suffered by him in connection therewith. Such right of indemnification shall be a contract right which may be enforced in any manner desired by such person. The expenses of officers and directors incurred in defending a civil or criminal action, suit or proceeding must be paid by the Corporation as they are incurred and in advance of the final disposition of the action, suit or proceeding, upon receipt of an undertaking by or on behalf of the director or officer to repay the amount if it is ultimately determined by a court of competent jurisdiction that he is not entitled to be indemnified by the Corporation. Such right of indemnification shall not be exclusive of any other right which such directors, officers or representatives may have or hereafter acquire, and, without limiting the generality of such statement, they shall be entitled to their respective rights of indemnification under any bylaw, agreement, vote of stockholders, provision of law, or otherwise, as well as their rights under this Article. WHEREAS, the parties intend by this Agreement to effect a reorganization under Section 368 of the Internal Revenue Code of 1986, as amended. 1.1 On the effective date of the Merger (the “Effective Date”), as provided herein, Pacific shall be merged with and into Genius, the separate existence of Pacific shall cease and Genius (hereinafter sometimes referred tows the “Surviving Corporation”) shall continue to exist under the name of Genius Brands International, Inc. by virtue of, and shall be governed by, the laws of the State of Nevada. 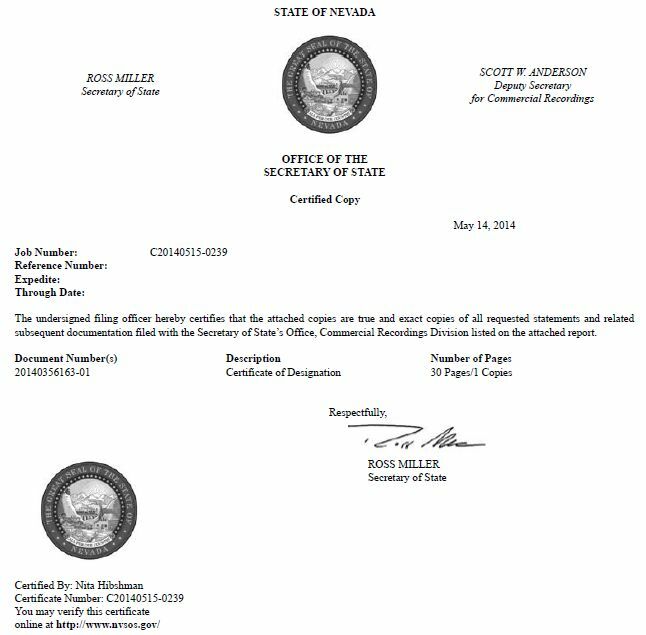 The address of the registered office of the Surviving Corporation in the State of Nevada will be The Corporation Trust Company of Nevada, 311 South Division Street, Carson City; Nevada 89703 (County of Carson City). 2.1 The name of the Surviving Corporation shall be “Genius Brands International, Inc.” The Articles of Incorporation of the Surviving Corporation, attached hereto as Exhibit A, as in effect on the date hereof, shall be the Articles of Incorporation of Genius without change, unless and until amended in accordance with this Agreement or otherwise amended in accordance with applicable law. 3.1 The Bylaws of the Surviving Corporation, as in effect on the date hereof shall be the Bylaws of Genius without change, unless and until amended in accordance with Article VIII of this Agreement or otherwise amended in accordance with applicable law. 4.1 On the Effective. Date, the holders of the common stock of Pacific shall receive one share of common stock of Genius (“Genius Common Stock”) as consideration and in exchange for each one share of common stock of Pacific and shall have no further claims of any kind or nature; and all of the common stock of Genius held by Pacific shall be surrendered and canceled. Each holder of record of any outstanding certificate or certificates theretofore representing stock of Pacific may surrender the same to the Surviving Corporation at its offices, and such holder shall be entitled upon such surrender to receive in exchange therefor a certificate or certificates representing the number of shares of common stock of the Surviving Corporation equal to the number of shares of common stock of the Corporation represented by such surrendered certificates (the “Conversion Amount”), provided however, that each certificate or certificates of the Corporation bearing a restrictive legend shall 'bear the same restrictive legend on the certificate or certificates of the Surviving Corporation. 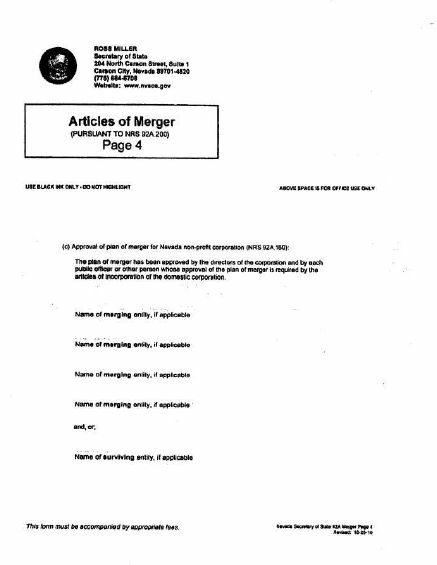 Until so surrendered, each outstanding certificate which prior to the effective time of the Merger represented one or more shares of stock of the Corporation shall be deemed for all corporate purposes to evidence ownership of shares of stock of the Surviving Corporation .equal to the Conversion Amount. 4.2 On the Effective Date, the holders of any options, warrants, or other securities of Pacific shall be enforced against Genius to the same extent as if such options, warrants, or other securities had been issued by Genius. 5.1 On the Effective Date, the separate existence of Pacific shall cease. Pacific shall be merged with and into Genius, the Surviving Corporation, in accordance with the provisions of this Agreement. Thereafter, Genius shall possess all the rights, privilege, powers and franchises of a public as well as of a private nature, and shall be subject to all the restriction; disabilities and duties of each of the parties to this Agreement; all singular rights, privileges, powers and franchises of Pacific and Genius, and all property, real, personal and mixed and all debts due to each of them on whatever account, shall be vested in Genius; and all property, rights, privileges, powers and franchises, and all and every other interest shall be thereafter the property of Genius, the Surviving Corporation, as they were of the respective constituent entities, and the title to any real estate, whether by deed or otherwise, vested in Pacific and Genius, or either of them, shall not revert or be in any way impaired by reason .of the Merger, but all rights of creditors and all liens upon the property of the parties hereto, shall be preserved unimpaired, and all debts, liabilities and duties of Pacific shall thenceforth attach to Genius, and may be enforced against it to the same extent as if said debts, liabilities and duties had been incurred or contracted by it. 5.2. Pacific agrees that it will execute and deliver, or cause to be executed and delivered, all such deeds and other instruments and will take or cause to be taken such further or other action as the Surviving Corporation may deem necessary in order to vest in and confirm to the Surviving Corporation title to and possession of all the property, rights, privileges, immunities, powers, purposes and franchises, and all and every other interest of Pacific and otherwise to carry out the intent and purposes of this Agreement. 6.2 If upon the Effective Date, a vacancy shall exist in the Board of Directors of the Surviving Corporation, such vacancy shall be filled in the manner provided by the Genius Bylaws. 7.1 Holders of shares of Pacific common stock who have complied with all requirements for perfecting their right of appraisal as required in the California Corporations Code shall be entitled to their rights under California law with payments to be made by the Surviving Corporation. 8.1 Promptly after the approval of this Agreement by the, requisite number of shareholders of Pacific, the respective Boards of Directors of Pacific and Genius will cause their duly authorized officers to make and execute Articles of Merger or other applicable certificates or documentation effecting this Agreement and shall cause the same to be filed with the Secretaries of Stare of California and Nevada, respectively; in accordance with the California Corporations Code and the Nevada Revised Statutes. 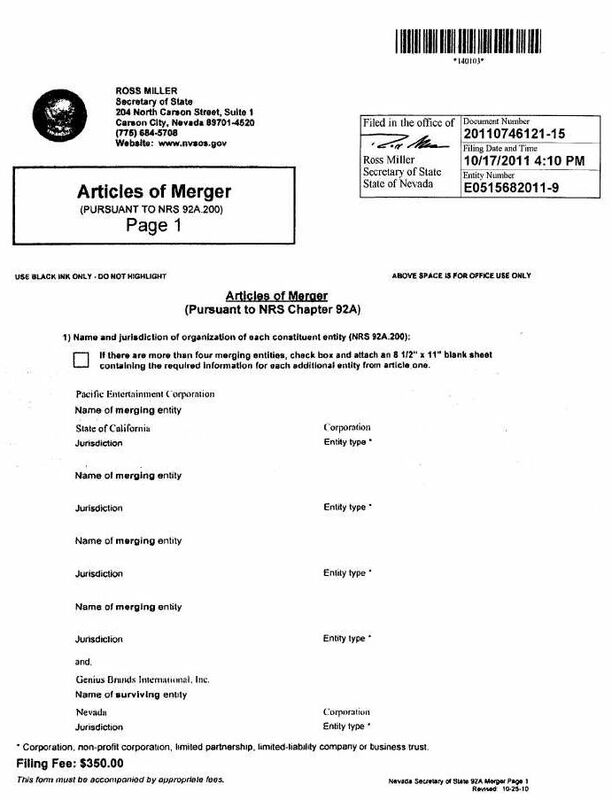 The Effective Date shall be the date on which the Articles of Merger is filed with the Secretary of State of California and the Secretary of State of Nevada. 8.2 The. 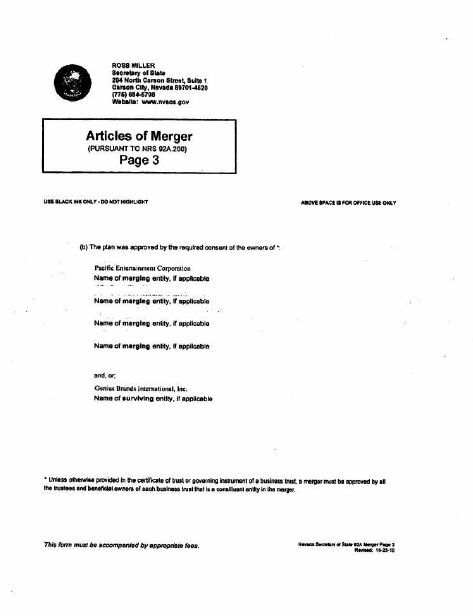 Boards of Directors of Pacific and Genius may amend, this Agreement and the Genius Articles of IncorPoration or Genius Bylaws at any time prior to the Effective Date, provided that an amendment made subsequent to the approval of the Merger by the shareholders of Pacific may not (i) change the amount or kind of shares to be received in exchange for the. Pacific common stock; or (ii) alter or change any of the terms and conditions of this Agreement or the Genius Articles of Incorporation or Genius Bylaws if such change would adversely affect the holders of the Genius Common Stock. 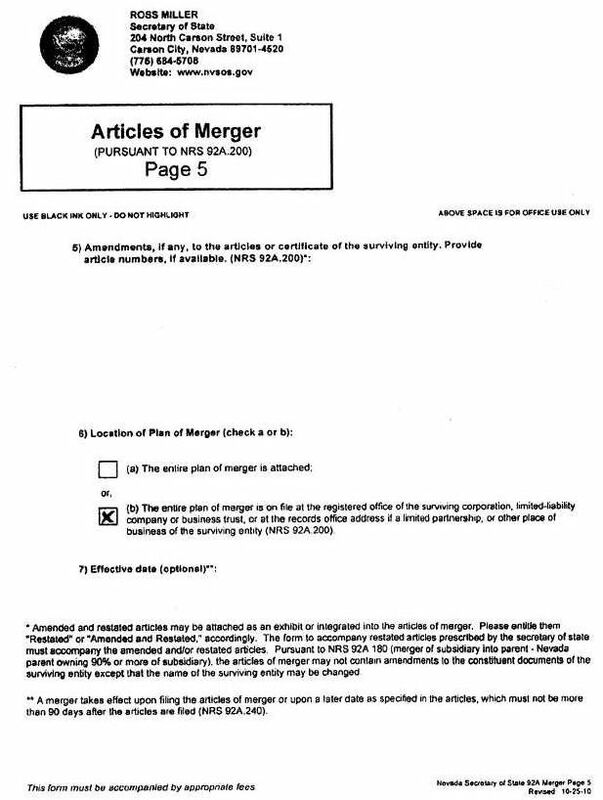 9.1 This Agreement may be terminated and the Merger abandoned at any time prior to the Effective Date, whether before or after shareholder approval of this Agreement, by the consent of the Board of Directors of Pacific; and Genius. 10.1 GOVERNING LAW. This Agreement shall be governed by and construed in accordance with the laws of the State of Nevada without reference to its principles of conflicts of law. 10.2 EXPENSES. 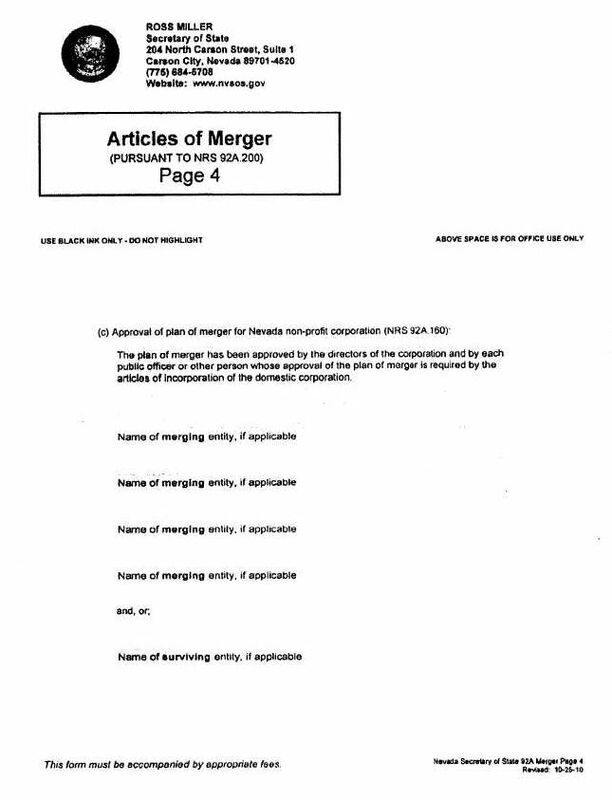 If the Merger becomes effective, the Surviving Corporation shall assume and pay all expenses, in connection:therewith not theretofore paid by the respective parties. 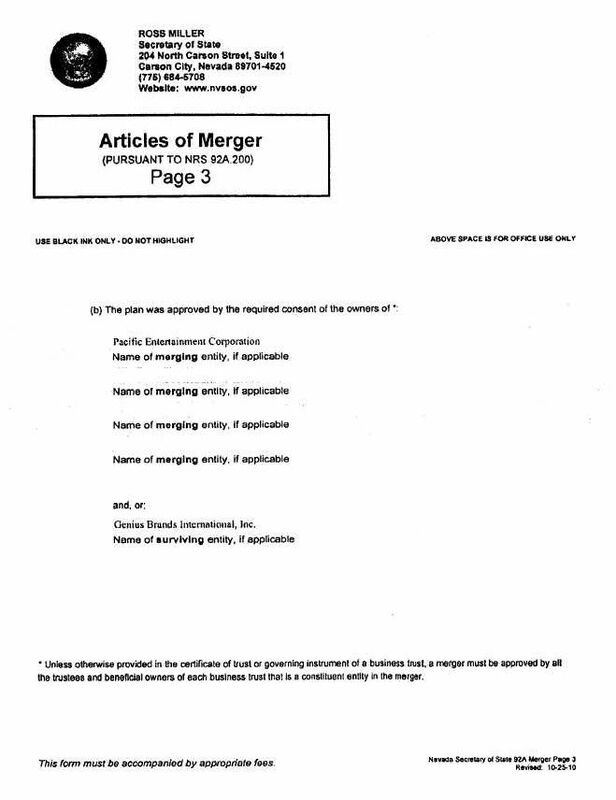 If for any reason the Merger shall not become effective; Pacific shall pay all expenses incurred in connection with all the proceedings taken in respect of this Merger Agreement or relating thereto. 10.3 AGREEMENT. 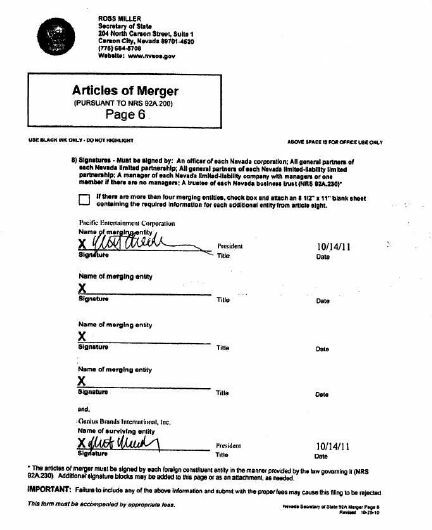 An executed copy of this Agreement will be on file at the principal place of business of the Surviving Corporation at 5820 Oberlin Drive, Suite 203, San Diego, California 92121, and, upon request and without cost, a copy thereof will be furnished to any shareholder. 10.4 COUNTERPARTS. This Agreement may be executed in any number of counterparts, each of which shall be deemed to be an original and all of which together shall constitute one and the same instrument. IN WITNESS WHEREOF, the parties hereto have caused this Agreement to be executed as of the day and`year first above written. 4.02 Common Stock. The total number of authorized shares of Common Stock shall be seven hundred million (700,000,000) shares with par value of $0.001 per share. Each share of Common Stock when issued, shall have one (1) vote on all matters presented to the stockholders. of Genius Brands International, Inc. Upon the filing and effectiveness (the "Effective Time") pursuant to the Nevada Revised Statutes of this amendment to the Corporation's Articles of Incorporation, each 100 shares of Common Stock issued and outstanding immediately prior to the Effective Time either issued and outstanding or held by the Corporation as treasury stock shall be combined into one (l) validly issued, fully paid and non-assessable share of Common Stock without any further action by the Corporation or the holder thereof (the "Reverse Stock Split"); provided that no fractional shares shall be issued to any holder and that instead of issuing such fractional shares, the Corporation shall round shares up to the nearest whole number. Each certificate that immediately prior to the Effective Time represented shares of Common Stock (''Old Certificates"), shall thereafter represent that number of shares of Common Stock into which the shares of Common Stock represented by the Old Certificate shall have been combined, subject to the treatment of fractional shares as described above. 1. Designation and Number of Shares. There shall hereby be created and established a series of preferred stock of the Company designated as "0% Series A Convertible Preferred Stock" (the "Preferred Shares"). The authorized number of Preferred Shares shall be 6,000 shares. Each Preferred Share shall have $0.001 par value. Capitalized terms not defined herein shall have the meaning as set forth in Section 23 below. 2. Ranking. Except to the extent that the holders of at least a majority of the outstanding Preferred Shares (the "Required Holders") expressly consent to the creation of Parity Stock (as defined below) or Senior Preferred Stock (as defined below) in accordance with Section 12, all shares of capital stock of the Company shall be junior in rank to all Preferred Shares with respect to the preferences as to dividends, distributions and payments upon the liquidation, dissolution and winding up of the Company (such junior stock is referred to herein collectively as "Junior Stock"). The rights of all such shares of capital stock of the Company shall be subject to the rights, powers, preferences and privileges of the Preferred Shares. 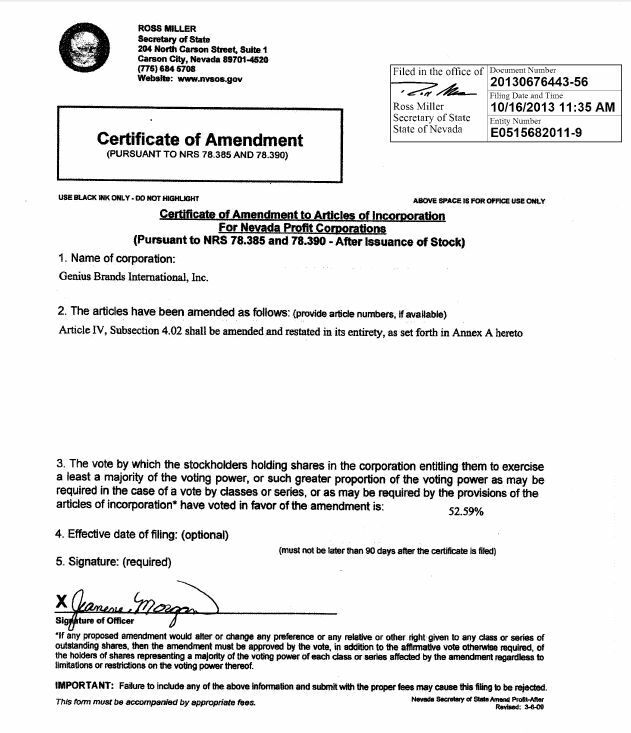 Without limiting any other provision of this Certificate of Designations, without the prior express consent of the Required Holders, voting separate as a single class, the Company shall not hereafter authorize or issue any additional or other shares of capital stock that is (i) of senior rank to the Preferred Shares in respect of the preferences as to dividends, distributions and payments upon the liquidation, dissolution and winding up of the Company (collectively, the "Senior Preferred Stock"), (ii) of pari passu rank to the Preferred Shares in respect of the preferences as to dividends, distributions and payments upon the liquidation, dissolution and winding up of the Company (collectively, the "Parity Stock") or (iii) any Junior Stock having a maturity date (or any other date requiring redemption or repayment of such shares of Junior Stock) that is prior to the date no Preferred Shares remain outstanding. 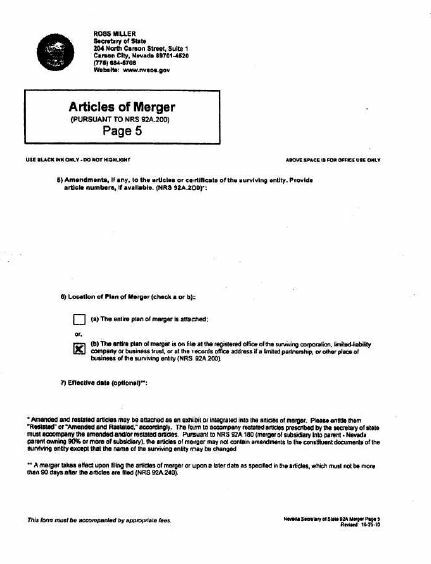 In the event of the merger or consolidation of the Company with or into another corporation, the Preferred Shares shall maintain their relative rights, powers, designations, privileges and preferences provided for herein and no such merger or consolidation shall result inconsistent therewith. 3. Dividends. In addition to Sections 5(a) and 11 below, from and after the first date of issuance of any Preferred Shares (the "Initial Issuance Date"), each holder of a Preferred Share (each, a "Holder" and collectively, the "Holders") shall be entitled to receive dividends ("Dividends") when and as declared by the Board, from time to time, in its sole discretion, which Dividends shall be paid by the Company out of funds legally available therefor, payable, subject to the conditions and other terms hereof, in cash on the Stated Value of such Preferred Share. 4. Conversion. Each Preferred Share shall be convertible into validly issued, fully paid and non-assessable shares of Common Stock (as defined below) on the terms and conditions set forth in this Section 4. (a) Holder's Conversion Right. Subject to the provisions of Section 4(e), at any time or times on or after the Initial Issuance Date, each Holder shall be entitled to convert any whole number of Preferred Shares into validly issued, fully paid and non-assessable shares of Common Stock in accordance with Section 4(c) at the Conversion Rate (as defined below). No fractional shares of Common Stock are to be issued upon the conversion of any Preferred Shares. If the issuance would result in the issuance of a fraction of a share of Common Stock, the Company shall round such fraction of a share of Common Stock up to the nearest whole share. (i) Holder's Conversion. To convert a Preferred Share into validly issued, fully paid and non-assessable shares of Common Stock on any date (a "Conversion Date"), a Holder shall deliver (whether via facsimile or otherwise), for receipt on or prior to 11:59 p.m., New York time, on such date, a copy of an executed notice of conversion of the share(s) of Preferred Shares subject to such conversion in the form attached hereto as Exhibit I (the "Conversion Notice") to the Company. If required by Section 4(c)(vi), within five (5) Trading Days following a conversion of any such Preferred Shares as aforesaid, such Holder shall surrender to a nationally recognized overnight delivery service for delivery to the Company the original certificates representing the share(s) of Preferred Shares (the "Preferred Share Certificates") so converted as aforesaid. (ii) Company's Response. On or before the first (1st) Trading Day following the date of receipt of a Conversion Notice, the Company shall transmit by facsimile an acknowledgment of confirmation, in the form attached hereto as Exhibit II, of receipt of such Conversion Notice to such Holder and the Transfer Agent, which confirmation shall constitute an instruction to the Transfer Agent to process such Conversion Notice in accordance with the terms herein. On or before the second (2nd) Trading Day following the date of receipt by the Company of such Conversion Notice, the Company shall (1) provided that the Transfer Agent is participating in DTC Fast Automated Securities Transfer Program, credit such aggregate number of shares of Common Stock to which such Holder shall be entitled to such Holder's or its designee's balance account with DTC through its Deposit/Withdrawal at Custodian system, or (2) if the Transfer Agent is not participating in the DTC Fast Automated Securities Transfer Program, issue and deliver (via reputable overnight courier) to the address as specified in such Conversion Notice, a certificate, registered in the name of such Holder or its designee, for the number of shares of Common Stock to which such Holder shall be entitled. If the number of Preferred Shares represented by the Preferred Share Certificate(s) submitted for conversion pursuant to Section 4(c)(vi) is greater than the number of Preferred Shares being converted, then the Company shall if requested by such Holder, as soon as practicable and in no event later than three (3) Trading Days after receipt of the Preferred Share Certificate(s) and at its own expense, issue and deliver to such Holder (or its designee) a new Preferred Share Certificate representing the number of Preferred Shares not converted. (iii) Record Holder. The Person or Persons entitled to receive the shares of Common Stock issuable upon a conversion of Preferred Shares shall be treated for all purposes as the record holder or holders of such shares of Common Stock on the Conversion Date. (iv) Company's Failure to Timely Convert. If the Company shall fail, for any reason or for no reason, to issue to a Holder within three (3) Trading Days after the Company's receipt of a Conversion Notice (whether via facsimile or otherwise) (the "Share Delivery Deadline"), a certificate for the number of shares of Common Stock to which such Holder is entitled and register such shares of Common Stock on the Company's share register or to credit such Holder's or its designee's balance account with DTC for such number of shares of Common Stock to which such Holder is entitled upon such Holder's conversion of any Preferred Shares (as the case may be) (a "Conversion Failure"), then, in addition to all other remedies available to such Holder, such Holder, upon written notice to the Company, (x) may void its Conversion Notice with respect to, and retain or have returned (as the case may be) any Preferred Shares that have not been converted pursuant to such Holder's Conversion Notice, provided that the voiding of a Conversion Notice shall not affect the Company's obligations to make any payments which have accrued prior to the date of such notice pursuant to the terms of this Certificate of Designations or otherwise and (y) the Company shall pay in cash to such Holder on each day after such third (3rd) Trading Day that the issuance of such shares of Common Stock is not timely effected an amount equal to 1.5% of the product of (A) the aggregate number of shares of Common Stock not issued to such Holder on a timely basis and to which the Holder is entitled and (B) the Closing Sale Price of the Common Stock on the Trading Day immediately preceding the last possible date on which the Company could have issued such shares of Common Stock to the Holder without violating Section 4(c). In addition to the foregoing, if within three (3) Trading Days after the Company's receipt of a Conversion Notice (whether via facsimile or otherwise), the Company shall fail to issue and deliver a certificate to such Holder and register such shares of Common Stock on the Company's share register or credit such Holder's or its designee's balance account with DTC for the number of shares of Common Stock to which such Holder is entitled upon such Holder's conversion hereunder (as the case may be), and if on or after such third (3rd) Trading Day such Holder (or any other Person in respect, or on behalf, of such Holder) purchases (in an open market transaction or otherwise) shares of Common Stock to deliver in satisfaction of a sale by such Holder of all or any portion of the number of shares of Common Stock, or a sale of a number of shares of Common Stock equal to all or any portion of the number of shares of Common Stock, issuable upon such conversion that such Holder so anticipated receiving from the Company, then, in addition to all other remedies available to such Holder, the Company shall, within three (3) Business Days after such Holder's request and in such Holder's discretion, either (i) pay cash to such Holder in an amount equal to such Holder's total purchase price (including brokerage commissions and other out-of-pocket expenses, if any) for the shares of Common Stock so purchased (including, without limitation, by any other Person in respect, or on behalf, of such Holder) (the "Buy-In Price"), at which point the Company's obligation to so issue and deliver such certificate or credit such Holder's balance account with DTC for the number of shares of Common Stock to which such Holder is entitled upon such Holder's conversion hereunder (as the case may be) (and to issue such shares of Common Stock) shall terminate, or (ii) promptly honor its obligation to so issue and deliver to such Holder a certificate or certificates representing such shares of Common Stock or credit such Holder's balance account with DTC for the number of shares of Common Stock to which such Holder is entitled upon such Holder's conversion hereunder (as the case may be) and pay cash to such Holder in an amount equal to the excess (if any) of the Buy-In Price over the product of (A) such number of shares of Common Stock multiplied by (B) the lowest Closing Sale Price of the Common Stock on any Trading Day during the period commencing on the date of the applicable Conversion Notice and ending on the date of such issuance and payment under this clause (ii). (v) Pro Rata Conversion; Disputes. In the event the Company receives a Conversion Notice from more than one Holder for the same Conversion Date and the Company can convert some, but not all, of such Preferred Shares submitted for conversion, the Company shall convert from each Holder electing to have Preferred Shares converted on such date a pro rata amount of such Holder's Preferred Shares submitted for conversion on such date based on the number of Preferred Shares submitted for conversion on such date by such Holder relative to the aggregate number of Preferred Shares submitted for conversion on such date. In the event of a dispute as to the number of shares of Common Stock issuable to a Holder in connection with a conversion of Preferred Shares, the Company shall issue to such Holder the number of shares of Common Stock not in dispute and resolve such dispute in accordance with Section 22. 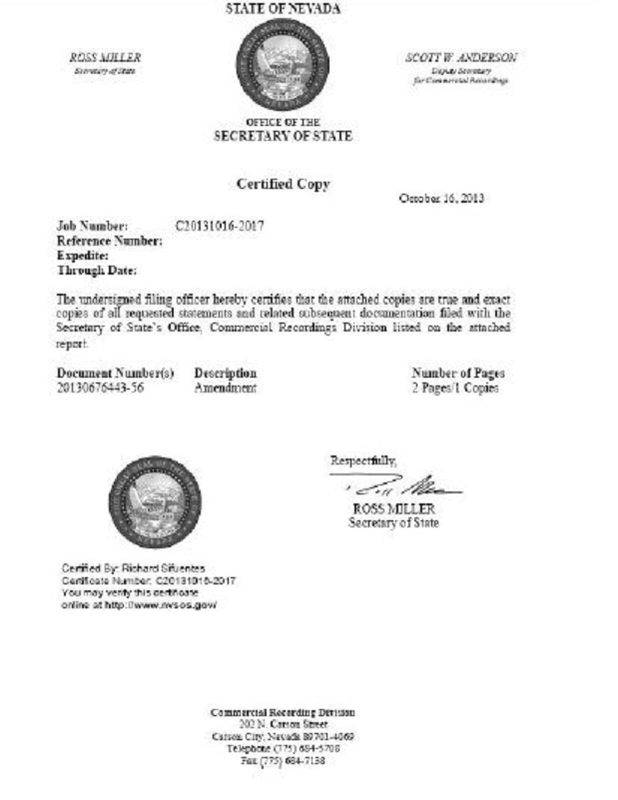 ANY TRANSFEREE OR ASSIGNEE OF THIS CERTIFICATE SHOULD CAREFULLY REVIEW THE TERMS OF THE CORPORATION'S CERTIFICATE OF DESIGNATIONS RELATING TO THE SHARES OF SERIES A PREFERRED STOCK REPRESENTED BY THIS CERTIFICATE, INCLUDING SECTION 4(c)(vi) THEREOF. THE NUMBER OF SHARES OF SERIES A PREFERRED STOCK REPRESENTED BY THIS CERTIFICATE MAY BE LESS THAN THE NUMBER OF SHARES OF SERIES A PREFERRED STOCK STATED ON THE FACE HEREOF PURSUANT TO SECTION 4(c)(vi) OF THE CERTIFICATE OF DESIGNATIONS RELATING TO THE SHARES OF SERIES A PREFERRED STOCK REPRESENTED BY THIS CERTIFICATE. (d) Taxes. The Company shall pay any and all documentary, stamp, transfer (but only in respect of the registered holder thereof), issuance and other similar taxes that may be payable with respect to the issuance and delivery of shares of Common Stock upon the conversion of Preferred Shares. (e) Limitation on Beneficial Ownership. Notwithstanding anything to the contrary contained in this Certificate of Designations, the Preferred Shares held by a Holder shall not be convertible by such Holder, and the Company shall not effect any conversion of any Preferred Shares held by such Holder, to the extent (but only to the extent) that such Holder or any of its affiliates would beneficially own in excess of 9.99% (the "Maximum Percentage") of the Common Stock. To the extent the above limitation applies, the determination of whether the Preferred Shares held by such Holder shall be convertible (vis-à-vis other convertible, exercisable or exchangeable securities owned by ;such Holder or any of its affiliates) and of which such securities shall be convertible, exercisable or exchangeable (as among all such securities owned by such Holder and its affiliates) shall, subject to such Maximum Percentage limitation, be determined on the basis of the first submission to the Company for conversion, exercise or exchange (as the case may be). No prior inability of a Holder to convert Preferred Shares, or of the Company to issue shares of Common Stock to such Holder, pursuant to this Section 4(e) shall have any effect on the applicability of the provisions of this Section 4(e) with respect to any subsequent determination of convertibility or issuance (as the case may be). For purposes of this Section 4(e), beneficial ownership and all determinations and calculations (including, without limitation, with respect to calculations of percentage ownership) shall be determined in accordance with Section 13(d) of the 1934 Act and the rules and regulations promulgated thereunder. The provisions of this Section 4(e) shall be implemented in a manner otherwise than in strict conformity with the terms of this Section 4(e) to correct this Section 4(e) (or any portion hereof) which may be defective or inconsistent with the intended Maximum Percentage beneficial ownership limitation herein contained or to make changes or supplements necessary or desirable to properly give effect to such Maximum Percentage limitation. The limitations contained in this Section 4(e) shall apply to a successor holder of Preferred Shares. The holders of Common Stock shall be third party beneficiaries of this Section 4(e) and the Company may not waive this Section 4(e) without the consent of holders of a majority of its Common Stock. For any reason at any time, upon the written or oral request of a Holder, the Company shall within one (1) Business Day confirm orally and in writing to such Holder the number of shares of Common Stock then outstanding, including by virtue of any prior conversion or exercise of convertible or exercisable securities into Common Stock, including, without limitation, pursuant to this Certificate of Designations or securities issued pursuant to the Exchange Agreements. By written notice to the Company, any Holder may increase or decrease the Maximum Percentage to any other percentage not in excess of 9.99% specified in such notice; provided that (i) any such increase will not be effective until the 61st day after such notice is delivered to the Company, and (ii) any such increase or decrease will apply only to such Holder sending such notice and not to any other Holder. 5. Rights Upon Issuance of Purchase Rights and Other Corporate Events. (a) Purchase Rights. In addition to any adjustments pursuant to Section 7 below, if at any time the Company grants, issues or sells any Options, Convertible Securities or rights to purchase stock, warrants, securities or other property pro rata to the record holders of any class of Common Stock (the "Purchase Rights"), then each Holder will be entitled to acquire, upon the terms applicable to such Purchase Rights, the aggregate Purchase Rights which such Holder could have acquired if such Holder had held the number of shares of Common Stock acquirable upon complete conversion of all the Preferred Shares (without taking into account any limitations or restrictions on the convertibility of the Preferred Shares) held by such Holder immediately before the date on which a record is taken for the grant, issuance or sale of such Purchase Rights, or, if no such record is taken, the date as of which the record holders of Common Stock are to be determined for the grant, issue or sale of such Purchase Rights (provided, however, to the extent that such Holder's right to participate in any such Purchase Right would result in such Holder exceeding the Maximum Percentage, then such Holder shall not be entitled to participate in such Purchase Right to such extent (or beneficial ownership of such shares of Common Stock as a result of such Purchase Right to such extent) and such Purchase Right to such extent shall be held in abeyance for such Holder until such time, if ever, as its right thereto would not result in such Holder exceeding the Maximum Percentage). (b) Other Corporate Events. In addition to and not in substitution for any other rights hereunder, prior to the consummation of any Fundamental Transaction pursuant to which holders of shares of Common Stock are entitled to receive securities or other assets with respect to or in exchange for shares of Common Stock (a "Corporate Event"), the Company shall make appropriate provision to insure that each Holder will thereafter have the right to receive upon a conversion of all the Preferred Shares held by such Holder (i) in addition to the shares of Common Stock receivable upon such conversion, such securities or other assets to which such Holder would have been entitled with respect to such shares of Common Stock had such shares of Common Stock been held by such Holder upon the consummation of such Corporate Event (without taking into account any limitations or restrictions on the convertibility of the Preferred Shares contained in this Certificate of Designations) or (ii) in lieu of the shares of Common Stock otherwise receivable upon such conversion, such securities or other assets received by the holders of shares of Common Stock in connection with the consummation of such Corporate Event in such amounts as such Holder would have been entitled to receive had the Preferred Shares held by such Holder initially been issued with conversion rights for the form of such consideration (as opposed to shares of Common Stock) at a conversion rate for such consideration commensurate with the Conversion Rate. The provisions of this Section 5(b) shall apply similarly and equally to successive Corporate Events and shall be applied without regard to any limitations on the conversion of the Preferred Shares contained in this Certificate of Designations. 6. Rights Upon Fundamental Transactions. (a) Assumption. The Company shall not enter into or be party to a Fundamental Transaction unless (i) the Successor Entity assumes in writing all of the obligations of the Company under this Certificate of Designations and the other Transaction Documents in accordance with the provisions of this Section 6 pursuant to written agreements in form and substance satisfactory to the Required Holders and approved by the Required Holders prior to such Fundamental Transaction, including agreements to deliver to each holder of Preferred Shares in exchange for such Preferred Shares a security of the Successor Entity evidenced by a written instrument substantially similar in form and substance to this Certificate of Designations, including, without limitation, having a stated value and dividend rate equal to the stated value and dividend rate of the Preferred Shares held by the Holders and having similar ranking to the Preferred Shares, and reasonably satisfactory to the Required Holders and (ii) the Successor Entity (including its Parent Entity) is a publicly traded corporation whose shares of common stock are quoted on or listed for trading on an Eligible Market. 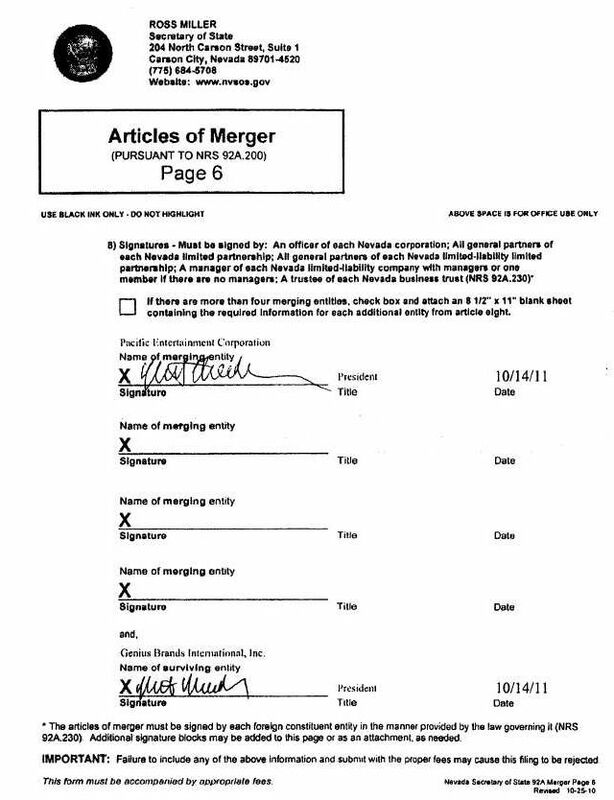 Upon the occurrence of any Fundamental Transaction, the Successor Entity shall succeed to, and be substituted for (so that from and after the date of such Fundamental Transaction, the provisions of this Certificate of Designations and the other Transaction Documents referring to the "Company" shall refer instead to the Successor Entity), and may exercise every right and power of the Company and shall assume all of the obligations of the Company under this Certificate of Designations and the other Transaction Documents with the same effect as if such Successor Entity had been named as the Company herein and therein. In addition to the foregoing, upon consummation of a Fundamental Transaction, the Successor Entity shall deliver to each Holder confirmation that there shall be issued upon conversion of the Preferred Shares at any time after the consummation of such Fundamental Transaction, in lieu of the shares of Common Stock (or other securities, cash, assets or other property (except such items still issuable under Sections 5 and 11, which shall continue to be receivable thereafter)) issuable upon the conversion of the Preferred Shares prior to such Fundamental Transaction, such shares of publicly traded common stock (or their equivalent) of the Successor Entity (including its Parent Entity) which each Holder would have been entitled to receive upon the happening of such Fundamental Transaction had all the Preferred Shares held by each Holder been converted immediately prior to such Fundamental Transaction (without regard to any limitations on the conversion of the Preferred Shares contained in this Certificate of Designations), as adjusted in accordance with the provisions of this Certificate of Designations. The provisions of this Section 6 shall apply similarly and equally to successive Fundamental Transactions and shall be applied without regard to any limitations on the conversion of the Preferred Shares. 7. Rights Upon Issuance of Other Securities. (i) Issuance of Options. If the Company in any manner grants or sells any Options and the lowest price per share for which one share of Common Stock is issuable upon the exercise of any such Option or upon conversion, exercise or exchange of any Convertible Securities issuable upon exercise of any such Option is less than the Applicable Price, then such share of Common Stock shall be deemed to be outstanding and to have been issued and sold by the Company at the time of the granting or sale of such Option for such price per share. For purposes of this Section 7(a)(i), the "lowest price per share for which one share of Common Stock is issuable upon the exercise of any such Options or upon conversion, exercise or exchange of any Convertible Securities issuable upon exercise of any such Option" shall be equal to (1) the lower of (x) the sum of the lowest amounts of consideration (if any) received or receivable by the Company with respect to any one share of Common Stock upon the granting or sale of such Option, upon exercise of such Option and upon conversion, exercise or exchange of any Convertible Security issuable upon exercise of such Option and (y) the lowest exercise price set forth in such Option for which one share of Common Stock is issuable upon the exercise of any such Options or upon conversion, exercise or exchange of any Convertible Securities issuable upon exercise of any such Option minus (2) the sum of all amounts paid or payable to the holder of such Option (or any other Person) upon the granting or sale of such Option, upon exercise of such Option and upon conversion, exercise or exchange of any Convertible Security issuable upon exercise of such Option plus the value of any other consideration received or receivable by, or benefit conferred on, the holder of such Option (or any other Person). Except as contemplated below, no further adjustment of the Conversion Price shall be made upon the actual issuance of such share of Common Stock or of such Convertible Securities upon the exercise of such Options or upon the actual issuance of such share of Common Stock upon conversion, exercise or exchange of such Convertible Securities. (ii) Issuance of Convertible Securities. If the Company in any manner issues or sells any Convertible Securities and the lowest price per share for which one share of Common Stock is issuable upon the conversion, exercise or exchange thereof is less than the Applicable Price, then such share of Common Stock shall be deemed to be outstanding and to have been issued and sold by the Company at the time of the issuance or sale of such Convertible Securities for such price per share. For purposes of this Section 7(a)(ii), the "lowest price per share for which one share of Common Stock is issuable upon the conversion, exercise or exchange thereof' shall be equal to (1) the lower of (x) the sum of the lowest amounts of consideration (if any) received or receivable by the Company with respect to one share of Common Stock upon the issuance or sale of the Convertible Security and upon conversion, exercise or exchange of such Convertible Security and (y) the lowest conversion price set forth in such Convertible Security for which one share of Common Stock is issuable upon conversion, exercise or exchange thereof minus (2) the sum of all amounts paid or payable to the holder of such Convertible Security (or any other Person) upon the issuance or sale of such Convertible Security plus the value of any other consideration received or receivable by, or benefit conferred on, the holder of such Convertible Security (or any other Person). Except as contemplated below, no further adjustment of the Conversion Price shall be made upon the actual issuance of such share of Common Stock upon conversion, exercise or exchange of such Convertible Securities, and if any such issue or sale of such Convertible Securities is made upon exercise of any Options for which adjustment of the Conversion Price has been or is to be made pursuant to other provisions of this Section 7(a), except as contemplated below, no further adjustment of the Conversion Price Shall be made by reason of such issue or sale. (iii) Change in Option Price or Rate of Conversion. If the purchase or exercise price provided for in any Options, the additional consideration, if any, payable upon the issue, conversion, exercise or exchange of any Convertible Securities, or the rate at which any Convertible Securities are convertible into or exercisable or exchangeable for shares of Common Stock increases or decreases at any time, the Conversion Price in effect at the time of such increase or decrease shall be adjusted to the Conversion Price which would have been in effect at such time had such Options or Convertible Securities provided for such increased or decreased purchase price, additional consideration or increased or decreased conversion rate (as the case may be) at the time initially granted, issued or sold. For purposes of this Section 7(a)(iii), if the terms of any Option or Convertible Security that was outstanding as of the Subscription Date are increased or decreased in the manner described in the immediately preceding sentence, then such Option or Convertible Security and the shares of Common Stock deemed issuable upon exercise, conversion or exchange thereof shall be deemed to have been issued as of the date of such increase or decrease. No adjustment pursuant to this Section 7(a) shall be made if such adjustment would result in an increase of the Conversion Price then in effect. (iv) Calculation of Consideration Received. If any Option or Convertible Security is issued in connection with the issuance or sale or deemed issuance or sale of any other securities of the Company (including, without limitation, any other Option or Convertible Security), together comprising one integrated transaction, (x) such Option or Convertible Security (as applicable) will be deemed to have been issued for consideration equal to the fair market value thereof as determined in good faith by the Company's Board of Directors and (y) the other securities issued or sold or deemed to have been issued or sold in such integrated transaction shall be deemed to have been issued for consideration equal to the difference of (I) the aggregate consideration received by the Company minus (II) the aggregate fair market value of all such Options and/or Convertible Securities (as applicable) so issued. If any shares of Common Stock, Options or Convertible Securities are issued or sold or deemed to have been issued or sold for cash, the consideration received therefor will be deemed to be the net amount of consideration received by the Company therefor. If any shares of Common Stock, Options or Convertible Securities are issued or sold for a consideration other than cash, the amount of such consideration received by the Company will be the fair value of such consideration, except where such consideration consists of publicly traded securities, in which case the amount of consideration received by the Company for such securities will be the arithmetic average of the VWAPs of such security for each of the five (5) Trading Days immediately preceding the date of receipt. If any shares of Common Stock, Options or Convertible Securities are issued to the owners of the non-surviving entity in connection with any merger in which the Company is the surviving entity, the amount of consideration therefor will be deemed to be the fair value of such portion of the net assets and business of the non-surviving entity as is attributable to such shares of Common Stock, Options or Convertible Securities, as the case may be. The fair value of any consideration other than cash or publicly traded securities will be determined jointly by the Company and the Required Holders. If such parties are unable to reach agreement within ten (10) days after the occurrence of an event requiring valuation (the "Valuation Event"), the fair value of such consideration will be determined within five (5) Trading Days after the tenth (10th) day following such Valuation Event by an independent, reputable appraiser jointly selected by the Company and the Required Holders. The determination of such appraiser shall be final and binding upon all parties absent manifest error and the fees and expenses of such appraiser shall be borne by the Company. (v) Record Date. If the Company takes a record of the holders of shares of Common Stock for the purpose of entitling them (A) to receive a dividend or other distribution payable in shares of Common Stock, Options or in Convertible Securities or (B) to subscribe for or purchase shares of Common Stock, Options or Convertible Securities, then such record date will be deemed to be the date of the issue or sale of the shares of Common Stock deemed to have been issued or sold upon the declaration of such dividend or the making of such other distribution or the date of the granting of such right of subscription or purchase (as the case may be). (b) Adjustment of Conversion Price upon Subdivision or Combination of Common Stock. Without limiting any provision of Sections 5 and 11, if the Company at any time on or after the Subscription Date subdivides (by any stock split, stock dividend, recapitalization or otherwise) one or more classes of its outstanding shares of Common Stock into a greater number of shares, the Conversion Price in effect immediately prior to such subdivision will be proportionately reduced. Without limiting any provision of Sections 5 and 11, if the Company at any time on or after the Subscription Date combines (by combination, reverse stock split or otherwise) one or more classes of its outstanding shares of Common Stock into a smaller number of shares, the Conversion Price in effect immediately prior to such combination will be proportionately increased. Any adjustment pursuant to this Section 7(b) shall become effective immediately after the effective date of such subdivision or combination. If any event requiring an adjustment under this Section 7(b) occurs during the period that a Conversion Price is calculated hereunder, then the calculation of such Conversion Price shall be adjusted appropriately to reflect such event. (c) Other Events. In the event that the Company (or any Subsidiary) shall take any action to which the provisions hereof are not strictly applicable, or, if applicable, would not operate to protect any Holder from dilution or if any event occurs of the type contemplated by the provisions of this Section 7 but not expressly provided for by such provisions (including, without limitation, the granting of stock appreciation rights, phantom stock rights or other rights with equity features), then the Board shall in good faith determine and implement an appropriate adjustment in the Conversion Price so as to protect the rights of such Holder, provided that no such adjustment pursuant to this Section 7(c) will increase the Conversion Price as otherwise determined pursuant to this Section 7, provided further that if such Holder does not accept such adjustments as appropriately protecting its interests hereunder against such dilution, then the Board and such Holder shall agree, in good faith, upon an independent investment bank of nationally recognized standing to make such appropriate adjustments, whose determination shall be final and binding and whose fees and expenses shall be borne by the Company. (d) Calculations. All calculations under this Section 7 shall be made by rounding to the nearest one-hundred thousandth of a cent or the nearest 1/100th of a share, as applicable. The number of shares of Common Stock outstanding at any given time shall not include shares owned or held by or for the account of the Company, and the disposition of any such shares shall be considered an issue or sale of Common Stock. (a) Reservation. The Company shall initially reserve out of its authorized and unissued Common Stock a number of shares of Common Stock equal to 125% of the Conversion Rate with respect to the Base Amount of each Preferred Share as of the Initial Issuance Date (assuming for purposes hereof, that all the Preferred Shares issuable pursuant to the Securities Purchase Agreement have been issued, such Preferred Shares are convertible at the Conversion Price and without taking into account any limitations on the conversion of such Preferred Shares set forth in herein) issuable pursuant to the terms of this Certificate of Designations from the Initial Issuance Date through the second anniversary of the Initial Issuance Date assuming (assuming for purposes hereof, that all the Preferred Shares issuable pursuant to the Securities Purchase Agreement have been issued and without taking into account any limitations on the issuance of securities set forth herein). So long as any of the Preferred Shares are outstanding, the Company shall take all action necessary to reserve and keep available out of its authorized and unissued shares of Common Stock, solely for the purpose of effecting the conversion of the Preferred Shares, as of any given date, 125% of the number of shares of Common Stock as shall from time to time be necessary to effect the conversion of all of the Preferred Shares issued or issuable pursuant to the Securities Purchase Agreement assuming for purposes hereof, that all the Preferred Shares issuable pursuant to the Securities Purchase Agreement have been issued and without taking into account any limitations on the issuance of securities set forth herein), provided that at no time shall the number of shares of Common Stock so available be less than the number of shares required to be reserved by the previous sentence (without regard to any limitations on conversions contained in this Certificate of Designations) (the "Required Amount"). The initial number of shares of Common Stock reserved for conversions of the Preferred Shares and each increase in the number of shares so reserved shall be allocated pro rata among the Holders based on the number of Preferred Shares held by each Holder on the Initial Issuance Date or increase in the number of reserved shares (as the case may be) (the "Authorized Share Allocation"). In the event a Holder shall sell or otherwise transfer any of such Holder's Preferred Shares, each transferee shall be allocated a pro rata portion of such Holder's Authorized Share Allocation. Any shares of Common Stock reserved and allocated to any Person which ceases to hold any Preferred Shares shall be allocated to the remaining Holders of Preferred Shares, pro rata based on the number of Preferred Shares then held by such Holders. (b) Insufficient Authorized Shares. If, notwithstanding Section 8(a) and not in limitation thereof, at any time while any of the Preferred Shares remain outstanding the Company does not have a sufficient number of authorized and unissued shares of Common Stock to satisfy its obligation to have available for issuance upon conversion of the Preferred Shares at least a number of shares of Common Stock equal to the Required Amount (an "Authorized Share Failure"), then the Company shall promptly take all action necessary to increase the Company's authorized shares of Common Stock to an amount sufficient to allow the Company to reserve and have available the Required Amount for all of the Preferred Shares then outstanding. Without limiting the generality of the foregoing sentence, as soon as practicable after the date of the occurrence of an Authorized Share Failure, but in no event later than ninety (90) days after the occurrence of such Authorized Share Failure, the Company shall hold a meeting of its stockholders or conduct a consent solicitation for the approval of an increase in the number of authorized shares of Common Stock. In connection with such meeting, the Company shall provide each stockholder with a proxy statement and shall use its best efforts to solicit its stockholders' approval of such increase in authorized shares of Common Stock and to cause its Board to recommend to the stockholders that they approve such proposal. Nothing contained in this Section 8 shall limit any obligations of the Company under any provision of the Securities Purchase Agreement. In the event that the Company is prohibited from issuing shares of Common Stock upon a conversion of any Preferred Share due to the failure by the Company to have sufficient shares of Common Stock available out of the authorized but unissued shares of Common Stock (such unavailable number of shares of Common Stock, the "Authorization Failure Shares"), in lieu of delivering such Authorization Failure Shares to such Holder of such Preferred Shares, the Company shall pay cash in exchange for the cancellation of such Preferred Shares convertible into such Authorized Failure Shares at a price equal to the sum of (i) the product of (x) such number of Authorization Failure Shares and (y) the Closing Sale Price on the Trading Day immediately preceding the date such Holder delivers the applicable Conversion Notice with respect to such Authorization Failure Shares to the Company and (ii) to the extent such Holder purchases (in an open market transaction or otherwise) shares of Common Stock to deliver in satisfaction of a sale by such Holder of Authorization Failure Shares, any brokerage commissions and other out-of-pocket expenses, if any, of such Holder incurred in connection therewith. 9. Voting Rights. Holders of Preferred Shares shall have no voting rights, except as required by law (including without limitation, the NGCL) and as expressly provided in this Certificate of Designations. To the extent that under the NGCL the vote of the holders of the Preferred Shares, voting separately as a class or Series As applicable, is required to authorize a given action of the Company, the affirmative vote or consent of the holders of all of the shares of the Preferred Shares, voting together in the aggregate and not in separate series unless required under the NGCL, represented at a duly held meeting at which a quorum is presented or by written consent of all of the Preferred Shares (except as otherwise may be required under the NGCL), voting together in the aggregate and not in separate series unless required under the NGCL, shall constitute the approval of such action by both the class or the series, as applicable. Subject to Section 4(e), to the extent that under the NGCL holders of the Preferred Shares are entitled to vote on a matter with holders of shares of Common Stock, voting together as one class, each Preferred Share shall entitle the holder thereof to cast that number of votes per share as is equal to the number of shares of Common Stock into which it is then convertible (subject to the ownership limitations specified in Section 4(e) hereof) using the record date for determining the stockholders of the Company eligible to vote on such matters as the date as of which the Conversion Price is calculated. Holders of the Preferred Shares shall be entitled to written notice of all stockholder meetings or written consents (and copies of proxy materials and other information sent to stockholders) with respect to which they would be entitled by vote, which notice would be provided pursuant to the Company's bylaws and the NGCL). 10. Liquidation, Dissolution. Winding-Up. In the event of a Liquidation Event, the Holders shall be entitled to receive in cash out of the assets of the Company, whether from capital or from earnings available for distribution to its stockholders (the "Liquidation Funds"), before any amount shall be paid to the holders of any of shares of Junior Stock, an amount per Preferred Share equal to the greater of (A) the Base Amount thereof on the date of such payment and (B) the amount per share such Holder would receive if such Holder converted such Preferred Shares into Common Stock immediately prior to the date of such payment, provided that if the Liquidation Funds are insufficient to pay the full amount due to the Holders and holders of shares of Parity Stock, then each Holder and each holder of Parity Stock shall receive a percentage of the Liquidation Funds equal to the full amount of Liquidation Funds payable to such Holder and such holder of Parity Stock as a liquidation preference, in accordance with their respective certificate of designations (or equivalent), as a percentage of the full amount of Liquidation Funds payable to all holders of Preferred Shares and all holders of shares of Parity Stock. To the extent necessary, the Company shall cause such actions to be taken by each of its Subsidiaries so as to enable, to the maximum extent permitted by law, the proceeds of a Liquidation Event to be distributed to the Holders in accordance with this Section 10. All the preferential amounts to be paid to the Holders under this Section 10 shall be paid or set apart for payment before the payment or setting apart for payment of any amount for, or the distribution of any Liquidation Funds of the Company to the holders of shares of Junior Stock in connection with a Liquidation Event as to which this Section 10 applies. 11. Participation. In addition to any adjustments pursuant to Section 7(b), the Holders shall, as holders of Preferred Shares, be entitled to receive such dividends paid and distributions made to the holders of shares of Common Stock to the same extent as if such Holders had converted each Preferred Share held by each of them into shares of Common Stock (without regard to any limitations on conversion herein or elsewhere) and had held such shares of Common Stock on the record date for such dividends and distributions. Payments under the preceding sentence shall be made concurrently with the dividend or distribution to the holders of shares of Common Stock (provided, however, to the extent that a Holder's right to participate in any such dividend or distribution would result in such Holder exceeding the Maximum Percentage, then such Holder shall not be entitled to participate in such dividend or distribution to such extent (or the beneficial ownership of any such shares of Common Stock as a result of such dividend or distribution to such extent) and such dividend or distribution to such extent shall be held in abeyance for the benefit of such Holder until such time, if ever, as its right thereto would not result in such Holder exceeding the Maximum Percentage). 12. Vote to Change the Terms of or Issue Preferred Shares. In addition to any other rights provided by law, except where the vote or written consent of the holders of a greater number of shares is required by law or by another provision of the Articles of Incorporation, without first obtaining the affirmative vote at a meeting duly called for such purpose or the written consent without a meeting of the Required Holders, voting together as a single class, the Company shall not: (a) amend or repeal any provision of, or add any provision to, its Articles of Incorporation or bylaws, or file any certificate of designations or articles of amendment of any series of shares of preferred stock, if such action would adversely alter or change in any respect the preferences, rights, privileges or powers, or restrictions provided for the benefit, of the Preferred Shares, regardless of whether any such action shall be by means of amendment to the Articles of Incorporation or by merger, consolidation or otherwise; (b) increase or decrease (other than by conversion) the authorized number of Preferred Shares; (c) without limiting any provision of Section 2, create or authorize (by reclassification or otherwise) any new class or series of shares that has a preference over or is on a parity with the Preferred Shares with respect to dividends or the distribution of assets on the liquidation, dissolution or winding up of the Company; (d) purchase, repurchase or redeem any shares of capital stock of the Company junior in rank to the Preferred Shares (other than pursuant to equity incentive agreements (that have in good faith been approved by the Board) with employees giving the Company the right to repurchase shares upon the termination of services); (e) without limiting any provision of Section 2, pay dividends or make any other distribution on any shares of any capital stock of the Company junior in rank to the Preferred Shares; (f) issue any Preferred Shares other than pursuant to the Securities Purchase Agreement; or (g) without limiting any provision of Section 16, whether or not prohibited by the terms of the Preferred Shares, circumvent a right of the Preferred Shares. (a) Incurrence of Indebtedness. The Company shall not, and the Company shall cause each of its Subsidiaries to not, directly or indirectly, incur or guarantee, assume or suffer to exist any Indebtedness (other than Permitted Indebtedness). (b) Existence of Liens. The Company shall not, and the Company shall cause each of its Subsidiaries to not, directly or indirectly, allow or suffer to exist any mortgage, lien, pledge, charge, security interest or other encumbrance upon or in any property or assets (including accounts and contract rights) owned by the Company or any of its Subsidiaries (collectively, "Liens") other than Permitted Liens. 14. Lost or Stolen Certificates. Upon receipt by the Company of evidence reasonably satisfactory to the Company of the loss, theft, destruction or mutilation of any certificates representing Preferred Shares (as to which a written certification and the indemnification contemplated below shall suffice as such evidence), and, in the case of loss, theft or destruction, of an indemnification undertaking by the applicable Holder to the Company in customary and reasonable form and, in the case of mutilation, upon surrender and cancellation of the certificate(s), the Company shall execute and deliver new certificate(s) of like tenor and date. 15. Remedies, Characterizations, Other Obligations, Breaches and Injunctive Relief. The remedies provided in this Certificate of Designations shall be cumulative and in addition to all other remedies available under this Certificate of Designations and any of the other Transaction Documents, at law or in equity (including a decree of specific performance and/or other injunctive relief), and no remedy contained herein shall be deemed a waiver of compliance with the provisions giving rise to such remedy. Nothing herein shall limit any Holder's right to pursue actual and consequential damages for any failure by the Company to comply with the terms of this Certificate of Designations. The Company covenants to each Holder that there shall be no characterization concerning this instrument other than as expressly provided herein. Amounts set forth or provided for herein with respect to payments, conversion and the like (and the computation thereof) shall be the amounts to be received by a Holder and shall not, except as expressly provided herein, be subject to any other obligation of the Company (or the performance thereof). The Company acknowledges that a breach by it of its obligations hereunder will cause irreparable harm to the Holders and that the remedy at law for any such breach may be inadequate. The Company therefore agrees that, in the event of any such breach or threatened breach, each Holder shall be entitled, in addition to all other available remedies, to an injunction restraining any such breach or any such threatened breach, without the necessity of showing economic loss and without any bond or other security being required. The Company shall provide all information and documentation to a Holder that is requested by such Holder to enable such Holder to confirm the Company's compliance with the terms and conditions of this Certificate of Designations. 16. Noncircumvention. The Company hereby covenants and agrees that the Company will not, by amendment of its Articles of Incorporation, bylaws or through any reorganization, transfer of assets, consolidation, merger, scheme of arrangement, dissolution, issue or sale of securities, or any other voluntary action, avoid or seek to avoid the observance or performance of any of the terms of this Certificate of Designations, and will at all times in good faith carry out all the provisions of this Certificate of Designations and take all action as may be required to protect the rights of the Holders. Without limiting the generality of the foregoing or any other provision of this Certificate of Designations, the Company (i) shall not increase the par value of any shares of Common Stock receivable upon the conversion of any Preferred Shares above the Conversion Price then in effect, (ii) shall take all such actions as may be necessary or appropriate in order that the Company may validly and legally issue fully paid and non-assessable shares of Common Stock upon the conversion of Preferred Shares and (iii) shall, so long as any Preferred Shares are outstanding, take all action necessary to reserve and keep available out of its authorized and unissued shares of Common Stock, solely for the purpose of effecting the conversion of the Preferred Shares, the maximum number of shares of Common Stock as shall from time to time be necessary to effect the conversion of the Preferred Shares then outstanding (without regard to any limitations on conversion contained herein). 17. Failure or Indulgence Not Waiver. No failure or delay on the part of a Holder in the exercise of any power, right or privilege hereunder shall operate as a waiver thereof, nor shall any single or partial exercise of any such power, right or privilege preclude other or further exercise thereof or of any other right, power or privilege. No waiver shall be effective unless it is in writing and signed by an authorized representative of the waiving party. This Certificate of Designations shall be deemed to be jointly drafted by the Company and all Holders and shall not be construed against any Person as the drafter hereof. 18. Notices. The Company shall provide each Holder of Preferred Shares with prompt written notice of all actions taken pursuant to the terms of this Certificate of Designations, including in reasonable detail a description of such action and the reason therefor. Whenever notice is required to be given under this Certificate of Designations, unless otherwise provided herein, such notice must be in writing and shall be given in accordance with Section 8(f) of the Securities Purchase Agreement. Without limiting the generality of the foregoing, the Company shall give written notice to each Holder (i) promptly following any adjustment of the Conversion Price, setting forth in reasonable detail, and certifying, the calculation of such adjustment and (ii) at least fifteen (15) days prior to the date on which the Company closes its books or takes a record (A) with respect to any dividend or distribution upon the Common Stock, (B) with respect to any grant, issuances, or sales of any Options, Convertible Securities or rights to purchase stock, warrants, securities or other property to all holders of shares of Common Stock as a class or (C) for determining rights to vote with respect to any Fundamental Transaction, dissolution or liquidation, provided, in each case, that such information shall be made known to the public prior to, or simultaneously with, such notice being provided to any Holder. 19. Transfer of Preferred Shares. Subject to the restrictions set forth in Section 2(g) of the Securities Purchase Agreement, a Holder may transfer some or all of its Preferred Shares without the consent of the Company. 20. Preferred Shares Register. The Company shall maintain at its principal executive offices (or such other office or agency of the Company as it may designate by notice to the Holders), a register for the Preferred Shares, in which the Company shall record the name, address and facsimile number of the Persons in whose name the Preferred Shares have been issued, as well as the name and address of each transferee. The Company may treat the Person in whose name any Preferred Shares is registered on the register as the owner and holder thereof for all purposes, notwithstanding any notice to the contrary, but in all events recognizing any properly made transfers. (a) Stockholder Matters. Any stockholder action, approval or consent required, desired or otherwise sought by the Company pursuant to the NGCL, the Articles of Incorporation, this Certificate of Designations or otherwise with respect to the issuance of Preferred Shares may be effected by written consent of the Company's stockholders or at a duly called meeting of the Company's stockholders, all in accordance with the applicable rules and regulations of the NGCL. This provision is intended to comply with the applicable sections of the NGCL permitting stockholder action, approval and consent affected by written consent in lieu of a meeting. (b) Amendment. This Certificate of Designations or any provision hereof may be amended by obtaining the affirmative vote at a meeting duly called for such purpose, or written consent without a meeting in accordance with the NGCL, of the Required Holders, voting separate as a single class, and with such other stockholder approval, if any, as may then be required pursuant to the NGCL and the Articles of Incorporation. (a) Disputes Over Closing Bid Price, Closing Sale Price, Conversion Price, VWAP or Fair Market Value. (i) In the case of a dispute relating to a Closing Bid Price, a Closing Sale Price, a Conversion Price, a VWAP or fair market value (as the case may be) (including, without limitation, a dispute relating to the determination of any of the foregoing), the Company or such applicable Holder (as the case may be) shall submit the dispute via facsimile (I) within two (2) Business Days after delivery of the applicable notice giving rise to such dispute to the Company or such Holder (as the case may be) or (II) if no notice gave rise to such dispute, at any time after such Holder learned of the circumstances giving rise to such dispute. If such Holder and the Company are unable to resolve such dispute relating to such Closing Bid Price, such Closing Sale Price, such Conversion Price, such VWAP or such fair market value (as the case may be) by 5:00 p.m. (New York time) on the third (3rd) Business Day following such delivery by the Company or such Holder (as the case may be) of such dispute to the Company or such Holder (as the case may be), then such Holder shall select an independent, reputable investment bank to resolve such dispute. (ii) Such Holder and the Company shall each deliver to such investment bank (x) a copy of the initial dispute submission so delivered in accordance with the first sentence of this Section 22(a) and (y) written documentation supporting its position with respect to such dispute, in each case, no later than 5:00 p.m. (New York time) by the fifth (5th) Business Day immediately following the date on which such Holder selected such investment bank (the "Dispute Submission Deadline") (the documents referred to in the immediately preceding clauses (x) and (y) are collectively referred to herein as the "Required Dispute Documentation") (it being understood and agreed that if either such Holder or the Company fails to so deliver all of the Required Dispute Documentation by the Dispute Submission Deadline, then the party who fails to so submit all of the Required Dispute Documentation shall no longer be entitled to (and hereby waives its right to) deliver or submit any written documentation or other support to such investment bank with respect to such dispute and such investment bank shall resolve such dispute based solely on the Required Dispute Documentation that was delivered to such investment bank prior to the Dispute Submission Deadline). Unless otherwise agreed to in writing by both the Company and such Holder or otherwise requested by such investment bank, neither the Company nor such Holder shall be entitled to deliver or submit any written documentation or other support to such investment bank in connection with such dispute (other than the Required Dispute Documentation). 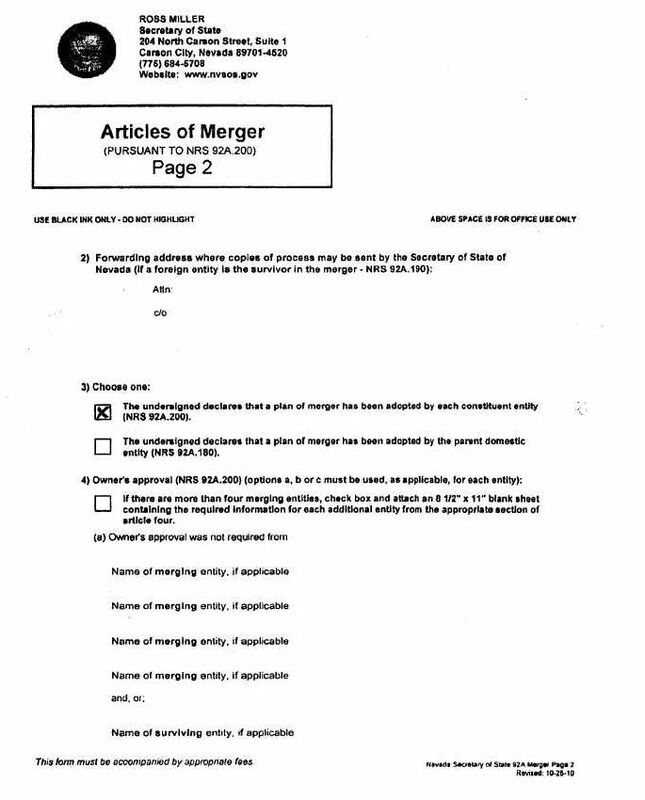 (iii) The Company and such Holder shall cause such investment bank to determine the resolution of such dispute and notify the Company and such Holder of such resolution no later than ten (10) Business Days immediately following the Dispute Submission Deadline. The fees and expenses of such investment bank shall be borne solely by the Company, and such investment bank's resolution of such 'dispute shall be final and binding upon all parties absent manifest error. (b) Disputes Over Arithmetic Calculation of the Conversion Rate. (i) In the case of a dispute as to the arithmetic calculation of a Conversion Rate, the Company or such Holder (as the case may be) shall submit the disputed arithmetic calculation via facsimile (i) within two (2) Business Days after delivery of the applicable notice giving rise to such dispute to the Company or such Holder (as the case may be) or (ii) if no notice gave rise to such dispute, at any time after such Holder learned of the circumstances giving rise to such dispute. If such Holder and the Company are unable to resolve such disputed arithmetic calculation of such Conversion Rate by 5:00 p.m. (New York time) on the third (31d) Business Day following such delivery by the Company or such Holder (as the case may be) of such disputed arithmetic calculation, then such Holder shall select an independent, reputable accountant or accounting firm to perform such disputed arithmetic calculation. (ii) Such Holder and the Company shall each deliver to such accountant or accounting firm (as the case may be) (x) a copy of the initial dispute submission so delivered in accordance with the first sentence of this Section 22(a) and (y) written documentation supporting its position with respect to such disputed arithmetic calculation, in each case, no later than 5:00 p.m. (New York time) by the fifth (5th) Business Day immediately following the date on which such Holder selected such accountant or accounting firm (as the case may be) (the "Submission Deadline") (the documents referred to in the immediately preceding clauses (x) and (y) are collectively referred to herein as the "Required Documentation") (it being understood and agreed that if either such Holder or the Company fails to so deliver all of the Required Documentation by the Submission Deadline, then the party who fails to so submit all of the Required Documentation shall no longer be entitled to (and hereby waives its right to) deliver or submit any written documentation or other support to such accountant or accounting firm (as the case may be) with respect to such disputed arithmetic calculation and such accountant or accounting firm (as the case may be) shall perform such disputed arithmetic calculation based solely on the Required Documentation that was delivered to such accountant or accounting firm (as the case may be) prior to the Submission Deadline). Unless otherwise agreed to in writing by both the Company and such Holder or otherwise requested by such accountant or accounting firm (as the case may be), neither the Company nor such Holder shall be entitled to deliver or submit any written documentation or other support to such accountant or accounting firm (as the case may be) in connection with such disputed arithmetic calculation of the Conversion Rate (other than the Required Documentation). (iii) The Company and such Holder shall cause such accountant or accounting firm (as the case may be) to perform such disputed arithmetic calculation and notify the Company and such Holder of the results no later than ten (10) Business Days immediately following the Submission Deadline. The fees and expenses of such accountant or accounting firm (as the case may be) shall be borne solely by the Company, and such accountant's or accounting firm's (as the case may be) arithmetic calculation shall be final and binding upon all parties absent manifest error. (c) Miscellaneous. The Company expressly acknowledges and agrees that (i) this Section 22 constitutes an agreement to arbitrate between the Company and such Holder (and constitutes an arbitration agreement) under § 7501, et seq. of the New York Civil Practice Law and Rules ("CPLR") and that each party shall be entitled to compel arbitration pursuant to CPLR § 7503(a) in order to compel compliance with this Section 22, (ii) a dispute relating to a Conversion Price includes, without limitation, disputes as to (1) whether an issuance or sale or deemed issuance or sale of Common Stock occurred under Section 7(a), (2) the consideration per share at which an issuance or deemed issuance of Common Stock occurred, (3) whether any issuance or sale or deemed issuance or sale of Common Stock was an issuance or sale or deemed issuance or sale of Excluded Securities, (4) whether an agreement, instrument, security or the like constitutes and Option or Convertible Security and (5) whether a Dilutive Issuance occurred, (iii) the terms of this Certificate of Designations and each other applicable Transaction Document shall serve as the basis for the selected investment bank's resolution of the applicable dispute, such investment bank shall be entitled (and is hereby expressly authorized) to make all findings, determinations and the like that such investment bank determines are required to be made by such investment bank in connection with its resolution of such dispute and in resolving such dispute such investment bank shall apply such findings, determinations and the like to the terms of this Certificate of Designations and any other applicable Transaction Documents, (iv) the terms of this Certificate of Designations and each other applicable Transaction Document shall serve as the basis for the selected accountant's or accounting firm's performance of the applicable arithmetic calculation, (v) for clarification purposes and without implication that the contrary would otherwise be true, disputes relating to matters described in Section 22(a) shall be governed by Section 22(a) and not by Section 22(b), (vi) such Holder (and only such Holder), in its sole discretion, shall have the right to submit any dispute described in this Section 22 to any state or federal court sitting in The City of New York, Borough of Manhattan in lieu of utilizing the procedures set forth in this Section 22 and (vii) nothing in this Section 22 shall limit such Holder from obtaining any injunctive relief or other equitable remedies (including, without limitation, with respect to any matters described in Section 22(a) or Section 22(b)). (a) "1934 Act" means the Securities Exchange Act of 1934, as amended. (b) "Bank" means a commercial banking institution that is a member of the Federal Reserve System and has a combined capital and surplus and undivided profits of not less than $500,000,000. (c) "Base Amount" means, with respect to each Preferred Share, as of the applicable date of determination, the sum of (1) the Stated Value thereof, plus (2) the Unpaid Dividend Amount thereon as of such date of determination. (d) "Bloomberg" means Bloomberg, L.P.
(e) "Business Day" means any day other than Saturday, Sunday or other day on which commercial banks in The City of New York are authorized or required by law to remain closed. (f) "Closing Bid Price" and "Closing Sale Price" means, for any security as of any date, the last closing bid price and last closing trade price, respectively, for such security on the Principal Market, as reported by Bloomberg, or, if the Principal Market begins to operate on an extended hours basis and does not designate the closing bid price or the closing trade price (as the case may be) then the last bid price or last trade price, respectively, of such security prior to 4:00:00 p.m., New York time, as reported by Bloomberg, or, if the Principal Market is not the principal securities exchange or trading market for such security, the last closing bid price or last trade price, respectively, of such security on the principal securities exchange or trading market where such security is listed or traded as reported by Bloomberg, or if the foregoing do not apply, the last closing bid price or last trade price, respectively, of such security in the over-the-counter market on the electronic bulletin board for such security as reported by Bloomberg, or, if no closing bid price or last trade price, respectively, is reported for such security by Bloomberg, the average of the bid prices, or the ask prices, respectively, of any market makers for such security as reported in the "pink sheets" by OTC Markets Group Inc. (formerly Pink Sheets LLC). If the Closing Bid Price or the Closing Sale Price cannot be calculated for a security on a particular date on any of the foregoing bases, the Closing Bid Price or the Closing Sale Price (as the case may be) of such security on such date shall be the fair market value as mutually determined by the Company and the applicable Holder. If the Company and such Holder are unable to agree upon the fair market value of such security, then such dispute shall be resolved in accordance with the procedures in Section 22. All such determinations shall be appropriately adjusted for any stock dividend, stock split, stock combination or other similar transaction during such period. (g) "Common Stock" means (i) the Company's shares of common stock, $0.001 par value per share, and (ii) any capital stock into which such common stock shall have been changed or any share capital resulting from a reclassification of such common stock. (h) "Conversion Price" means, with respect to each Preferred Share, as of any Conversion Date or other applicable date of determination, $2.00, subject to adjustment as provided herein. (i) "Convertible Securities" means any stock or other security (other than Options) that is at any time and under any circumstances, directly or indirectly, convertible into, exercisable or exchangeable for, or which otherwise entitles the holder thereof to acquire, any shares of Common Stock. (j) "Eligible Market" means The New York Stock Exchange, the NYSE MKT, the Nasdaq Global Select Market, the Nasdaq Global Market, the Nadsaq Capital Market or the Principal Market (or any successor thereto). (k) "Fundamental Transaction" " means that (i) the Company or any of its Subsidiaries shall, directly or indirectly, in one or more related transactions, (I) consolidate or merge with or into (whether or not the Company or any of its Subsidiaries is the surviving corporation) any other Person, or (2) sell, lease, license, assign, transfer, convey or otherwise dispose of all or substantially all of its respective properties or assets to any other Person, or (3) allow any other Person to make a purchase, tender or exchange offer that is accepted by the holders of more than 50% of the outstanding shares of Voting Stock of the Company (not including any shares of Voting Stock of the Company held by the Person or Persons making or party to, or associated or affiliated with the Persons making or party to, such purchase, tender or exchange offer), or (4) consummate a stock or share purchase agreement or other business combination (including, without limitation, a reorganization, recapitalization, spin-off or scheme of arrangement) with any other Person whereby such other Person acquires more than 50% of the outstanding shares of Voting Stock of the Company (not including any shares of Voting Stock of the Company held by the other Person or other Persons making or party to, or associated or affiliated with the other Persons making or party to, such stock or share purchase agreement or other business combination), or (5) reorganize, recapitalize or reclassify the Common Stock, or (ii) any "person" or "group" (as these terms are used for purposes of Sections 13(d) and 14(d) of the 1934 Act and the rules and regulations promulgated thereunder) is or shall become the "beneficial owner" (as defined in Rule 13d-3 under the 1934 Act), directly or indirectly, of 50% of the aggregate ordinary voting power represented by issued and outstanding Voting Stock of the Company. (l) "Holder Pro Rata Amount" means, with respect to any Holder, a fraction (i) the numerator of which is the number of Preferred Shares issued to such Holder pursuant to the Securities Purchase Agreement on the Initial Issuance Date and (ii) the denominator of which is the number of Preferred Shares issued to all Holders pursuant to the Securities Purchase Agreement on the Initial Issuance Date. (m) "LIBOR" means, (i) the one-month London Interbank Offered Rate for deposits in U.S. dollars, as shown on such date in The Wall Street Journal (Eastern Edition) under the caption "Money Rates - London interbank offered rate or Libor"; or (ii) if The Wall Street Journal does not publish such rate, the offered one-month rate far deposits in U.S. dollars which appears on the Reuters Screen LIBO Page as of 10:00 a.m., New York time, each day, provided that if at least two rates appear on the Reuters Screen LIBO Page on any day, the "LIBOR" for such day shall be the arithmetic mean of such rates. (n) "Liquidation Event" means, whether in a single transaction or series of transactions, the voluntary or involuntary liquidation, dissolution or winding up of the Company or such Subsidiaries the assets of which constitute all or substantially all of the assets of the business of the Company and its Subsidiaries, taken as a whole. (o) "Options" means any rights, warrants or options to subscribe for or purchase shares of Common Stock or Convertible Securities. (p) "Parent Entity" of a Person means an entity that, directly or indirectly, controls the applicable Person and whose common stock or equivalent equity security is quoted or listed on an Eligible Market, or, if there is more than one such Person or Parent Entity, the Person or Parent Entity with the largest public market capitalization as of the date of consummation of the Fundamental Transaction. (q) "Permitted Indebtedness" means (i) Indebtedness described in Schedule 3(s) of the Securities Purchase Agreement as in effect as of the Initial Issuance Date; provided, that the principal amount of such Indebtedness is not increased, the terms of such Indebtedness are not modified to impose more burdensome terms upon the Company or any of its Subsidiaries and the terms of such Indebtedness are not materially changed in any manner that adversely affects any Holder, and (ii) any Permitted Line of Credit. (r) "Permitted Liens" means (i) any Lien for taxes not yet due or delinquent or being contested in good faith by appropriate proceedings for which adequate reserves have been established in accordance with GAAP, (ii) any statutory Lien arising in the ordinary course of business by operation of law with respect to a liability that is not yet due or delinquent, (iii) any Lien created by operation of law, such as materialmen's liens, mechanics' liens and other similar liens, arising in the ordinary course of business with respect to a liability that is not yet due or delinquent or that are being contested in good faith by appropriate proceedings, (iv) leases or subleases and licenses and sublicenses granted to others in the ordinary course of the Company's business, not interfering in any material respect with the business of the Company and its Subsidiaries taken as a whole, (v) Liens in favor of customs and revenue authorities arising as a matter of law to secure payments of custom duties in connection with the importation of goods, (vi) Liens arising from judgments, decrees or attachments, not in excess of $100,000 in the aggregate, (vii) Liens with respect to any Permitted Line of Credit and (viii) the Liens described on Schedule 3(s) of the Securities Purchase Agreement. (s) "Permitted Line of Credit" means the principal of (and premium, if any), interest on, and all fees and other amounts (including, without limitation, any reasonable out-of-pocket costs, enforcement expenses (including reasonable out-of-pocket legal fees and disbursements), collateral protection expenses and other reimbursement or indemnity obligations relating thereto) payable by Company and/or its Subsidiaries under or in connection with any line of credit to be entered into by the Company and/or its Subsidiaries with one or more Banks (and on terms and conditions), in form and substance reasonably satisfactory to the Required Holders; provided, however, that such indebtedness (i) is not convertible or exchangeable into Common Stock, Convertible Securities Options or any other securities of the Company or any of its Subsidiaries, (ii) is not being made in connection with the issuance to any Person of Common Stock, Convertible Securities Options or any other securities of the Company or any of its Subsidiaries, (iii) bears total interest and fees at a rate not in excess of 450 basis points over LIBOR per annum, (iv) is consummated on market terms and (v) the aggregate outstanding principal amount of such Indebtedness does not at any time exceed $3,000,000. (t) "Person" means an individual, a limited liability company, a partnership, a joint venture, a corporation, a trust, an unincorporated organization, any other entity or a government or any department or agency thereof. (u) "Principal Market" means the OTCQB. (v) "SEC" means the Securities and Exchange Commission or the successor thereto. (w) "Securities" means, collectively, the Preferred Shares and the shares of Common Stock issuable upon conversion of (or otherwise in accordance with) the Preferred Shares. (x) "Securities Purchase Agreement" means that certain securities purchase agreement by and among the Company and the initial holders of Preferred Shares, dated as of the Subscription Date, as may be amended from time in accordance with the terms thereof. (y) "Stated Value" shall mean $1,000 per share, subject to adjustment for stock splits, stock dividends, recapitalizations, reorganizations, reclassifications, combinations, subdivisions or other similar events occurring after the Initial Issuance Date with respect to the Preferred Shares. (z) "Subscription Date" means May 14, 2014. (aa) "Subsidiaries" shall have the meaning as set forth in the Securities Purchase Agreement. (bb) "Successor Entity" means the Person (or, if so elected by the Required Holders, the Parent Entity) formed by, resulting from or surviving any Fundamental Transaction or the Person (or, if so elected by the Required Holders, the Parent Entity) with which such Fundamental Transaction shall have been entered into. (cc) "Trading Day" means, as applicable, (x) with respect to all price determinations relating to the Common Stock, any day on which the Common Stock is traded on the Principal Market, or, if the Principal. Market is not the principal trading market for the Common Stock, then on the principal securities exchange or securities market on which the Common Stock is then traded, provided that "Trading Day" shall not include any day on which the Common Stock is scheduled to trade on such exchange or market for less than 4.5 hours or any day that the Common Stock is suspended from trading during the final hour of trading on such exchange or market (or if such exchange or market does not designate in advance the closing time of trading on such exchange or market, then during the hour ending at 4:00:00 p.m., New York time) unless such day is otherwise designated as a Trading Day in writing by the Required Holders or (y) with respect to all determinations other than price determinations relating to the Common Stock, any day on which The New York Stock Exchange (or any successor thereto) is open for trading of securities. (dd) "Transaction Documents" means the Securities Purchase Agreement, this Certificate of Designations, the Registration Rights Agreement and each of the other agreements and instruments entered into or delivered by the Company or any of the Holders in connection with the transactions contemplated by the Securities Purchase Agreement, all as may be amended from time to time in accordance with the terms thereof. (ee) "Unpaid Dividend Amount" means, as of the applicable date of determination, with respect to each Preferred Share, all accrued and unpaid Dividends on such Preferred Share. (ff) "Voting Stock" of a Person means capital stock of such Person of the class or classes pursuant to which the holders thereof have the general voting power to elect, or the general power to appoint, at least a majority of the board of directors, managers, trustees or other similar governing body of such Person (irrespective of whether or not at the time capital stock of any other class or classes shall have or might have voting power by reason of the happening of any contingency). (gg) "VWAP" means, for any security as of any date, the dollar volume-weighted average price for such security on the Principal Market (or, if the Principal 25 Market is not the principal trading market for such security, then on the principal securities exchange or securities market on which such security is then traded) during the period beginning at 9:30:01 a.m., New York time, and ending at 4:00:00 p.m., New York time, as reported by Bloomberg through its "HP" function set to "weighted average" or, if the foregoing does not apply, the dollar volume-weighted average price of such security in the over-the-counter market on the electronic bulletin board for such security during the period beginning at 9:30:01 a.m., New York time, and ending at 4:00:00 p.m., New York time, as reported by Bloomberg, or, if no dollar volume-weighted average price is reported for such security by Bloomberg for such hours, the average of the highest closing bid price and the lowest closing ask price of any of the market makers for such security as reported in the "pink sheets" by OTC Markets Group Inc. (formerly Pink Sheets LLC). If the VWAP cannot be calculated for such security on such date on any of the foregoing bases, the VWAP of such security on such date shall be the fair market value as mutually determined by the Company and such Holder. If the Company and such Holder are unable to agree upon the fair market value of such security, then such dispute shall be resolved in accordance with the procedures in Section 22. All such determinations shall be appropriately adjusted for any stock dividend, stock split, stock combination or other similar transaction during such period. 24. Disclosure. 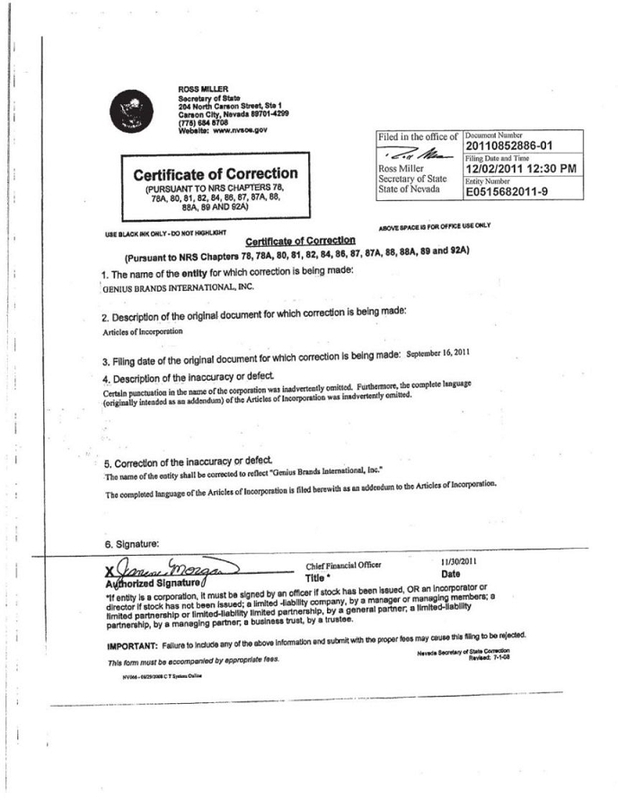 Upon receipt or delivery by the Company of any notice in accordance with the terms of this Certificate of Designations, unless the Company has in good faith determined that the matters relating to such notice do not constitute material, non-public information relating to the Company or any of its Subsidiaries, the Company shall simultaneously with any such receipt or delivery publicly disclose such material, non-public information on a Current Report on Form 8-K or otherwise. In the event that the Company believes that a notice contains material, non-public information relating to the Company or any of its Subsidiaries, the Company so shall indicate to each Holder contemporaneously with delivery of such notice, and in the absence of any such indication, each Holder shall be allowed to presume that all matters relating to such notice do not constitute material, non-public information relating to the Company or its Subsidiaries. Nothing contained in this Section 24 shall limit any obligations of the Company, or any rights of any Holder, under the Securities Purchase Agreement. 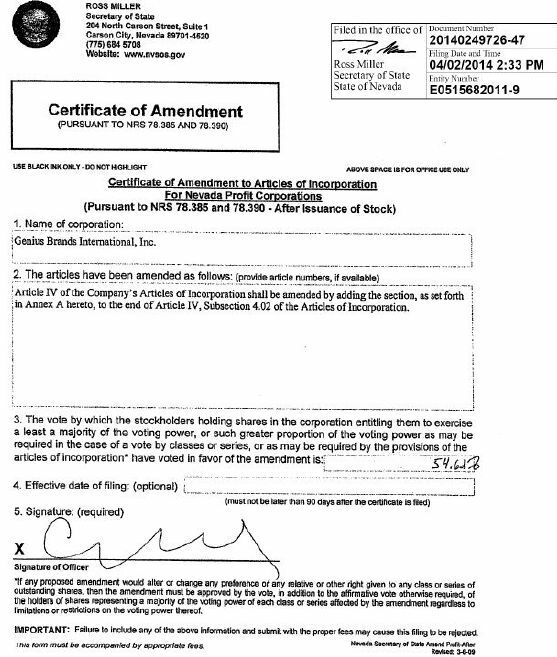 IN WITNESS WHEREOF, the Corporation has caused this Certificate of Designations of Series A Convertible Preferred Stock of Genius Brands International, Inc. to be signed by its Chief Executive Officer on this 14th day of May, 2014. Reference is made to the Certificate of Designations, Preferences and Rights of the Series A Convertible Preferred Stock of Genius Brands International, Inc. (the "Certificate of Designations"). 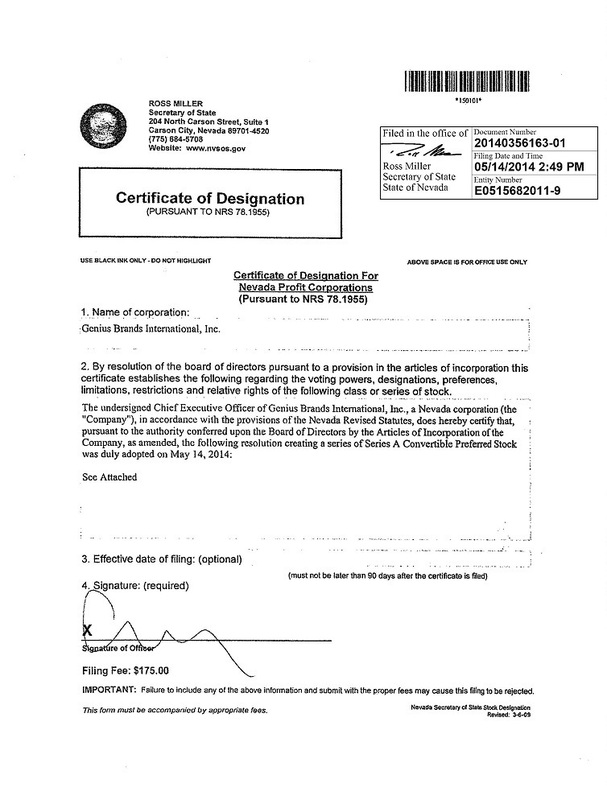 In accordance with and pursuant to the Certificate of Designations, the undersigned hereby elects to convert the number of shares of Series A Convertible Preferred Stock, $0.001 par value per share (the "Preferred Shares"), of Genius Brands International, Inc., a Nevada corporation (the "Company"), indicated below into shares of common stock, $0.001 par value per share (the "Common Stock"), of the Company, as of the date specified below. 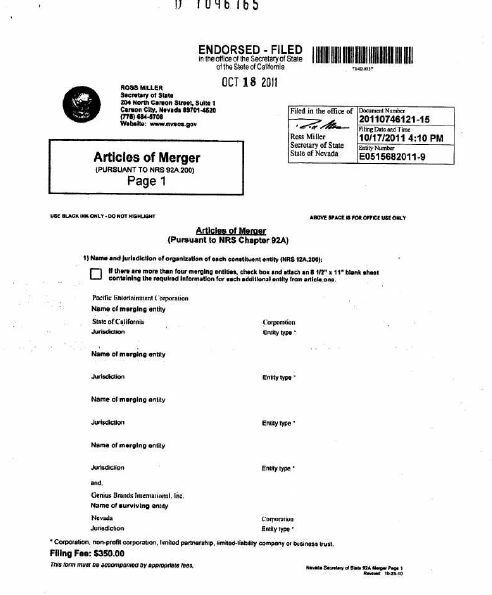 The Company hereby acknowledges this Conversion Notice and hereby directs __________________ to issue the above indicated number of shares of Common Stock in accordance with the Irrevocable Transfer Agent Instructions dated _______, 2014 from the Company and acknowledged and agreed to by____________. 2. The board of directors have adopted a resolution pursuant to NRS 78.209 and have obtained any required approval of the stockholders. 700,000,000 authorized shares of Common Stock, par value $0.001 per share. 10,000,000 authorized shares of Preferred Stock, par value $0.001 per share. 233,333,334 authorized shares of Common Stock, par value $0.001 per share. One (1) share of Common Stock will be issued in exchange for every three (3) shares of issued and outstanding Common Stock. All fractional shares of Common Stock will be rounded up to the nearest whole share.